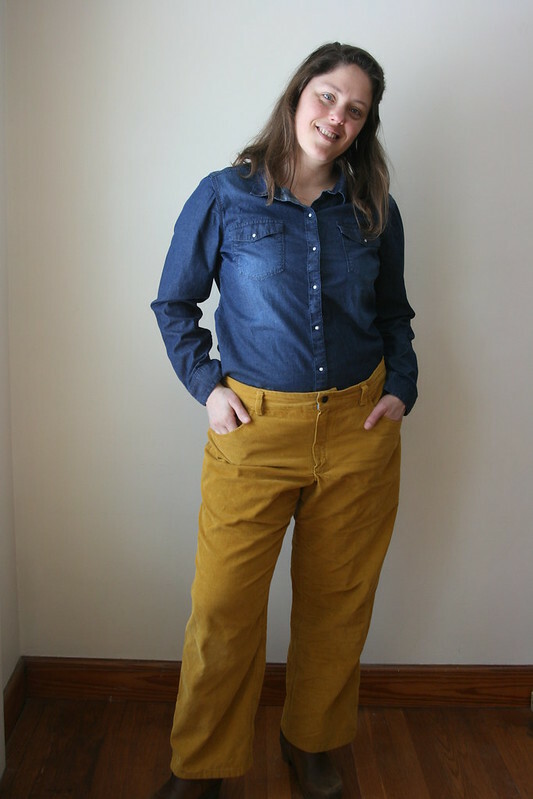 Today’s post is almost the last winter clothing post. (Oh, wait. I just realized I’m sewing sweatshirts right now. 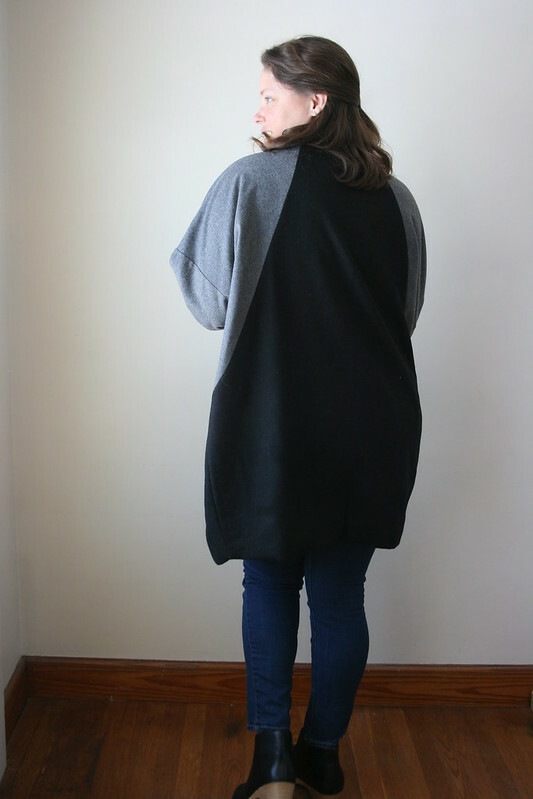 Well…this is one of the last ones I sewed during the winter.) 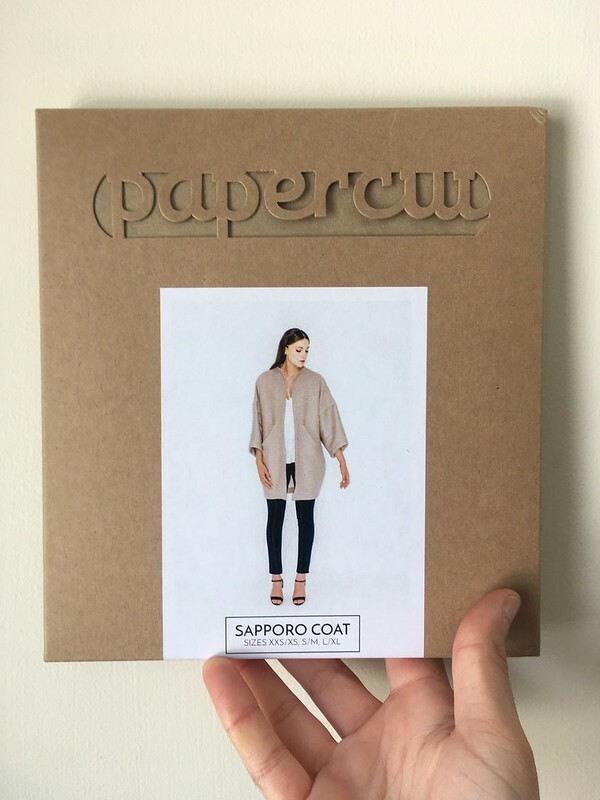 I saved this one for early spring because it’s a great transitional garment…the Sapporo Coat from Papercut Patterns. 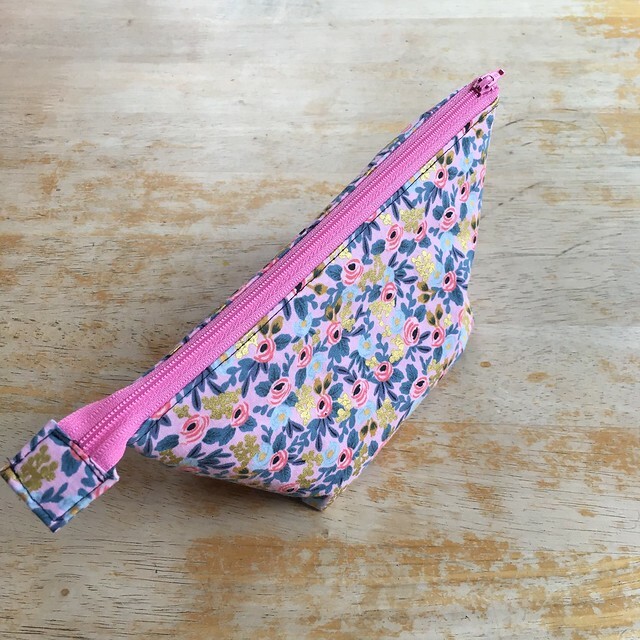 This is a pattern I have had my eye on for awhile, so I put it on my Christmas list, and my husband was kind enough to order it for me from Pattern Review. (He’s the best.) Papercut always has really interesting patterns, and this one is no different. 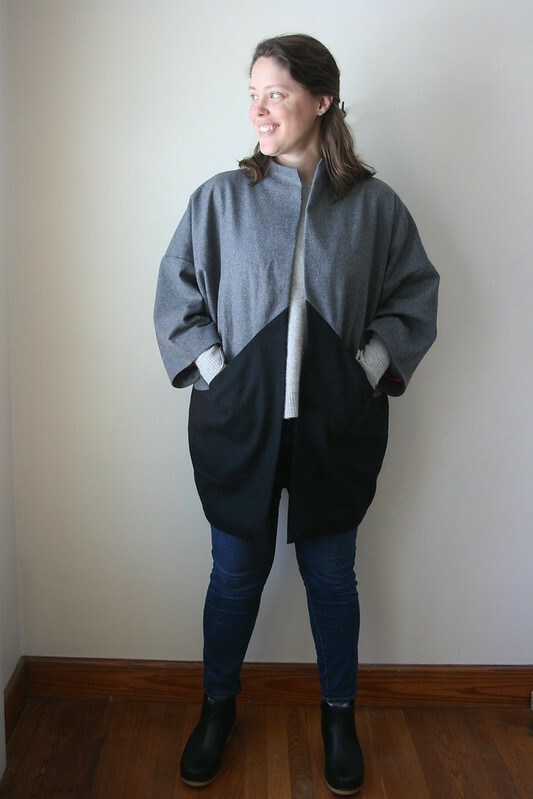 Cocoon coats are sort of a funny shape, but I like trying new types of clothing, and the possibility of color-blocking and highlighting the cool seamlines really drew me in. 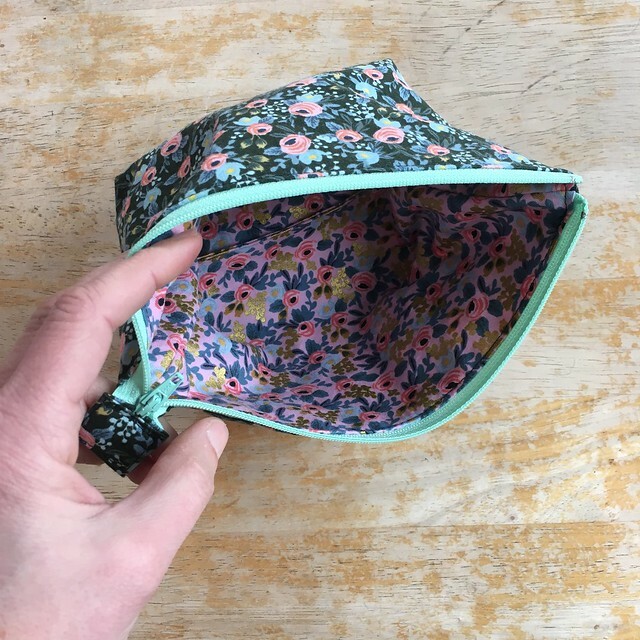 It was an added benefit that I had fabric in my stash that I could use, so I didn’t have to get any new fabric for this. 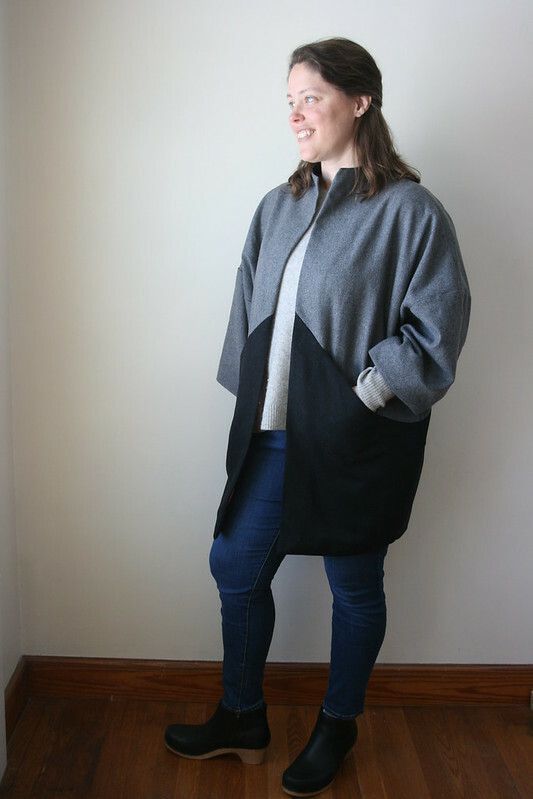 I chose gray and black wools from my stash for the outside with a polyester lining. The wool was given to me by friends ages ago, and the lining was purchased for another project, but never got used. It’s originally from Fabric Place Basement in Natick, MA. 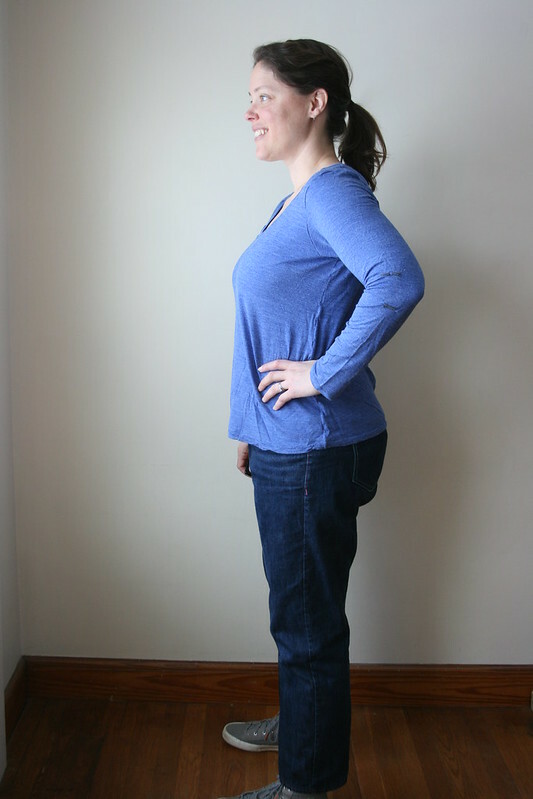 When choosing a pattern size, I nearly always have to grade up a size for the waist and hip. According to my measurements, I should have done that for this pattern as well, but it’s not the easiest pattern to do that with, so I went with my bust size (S/M) and hoped for the best. 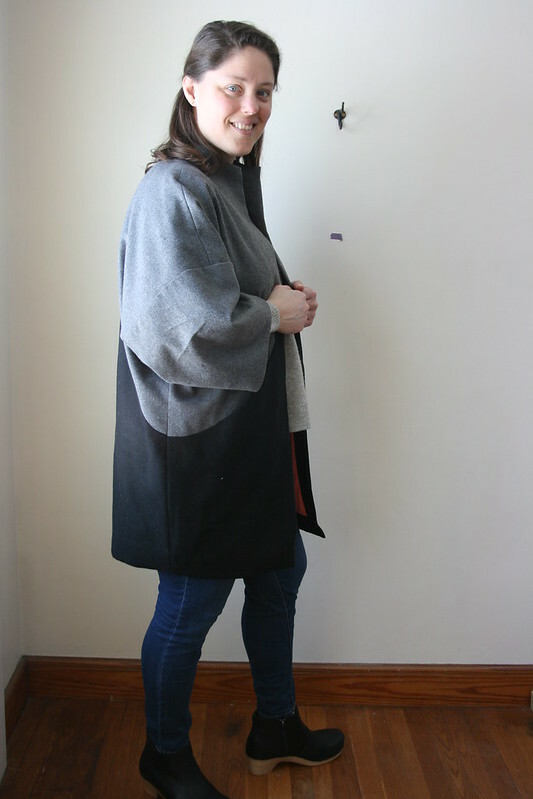 It helps that this coat is oversized and meant to be worn open. I think it turned out alright. The sewing itself was pretty easy and enjoyable. 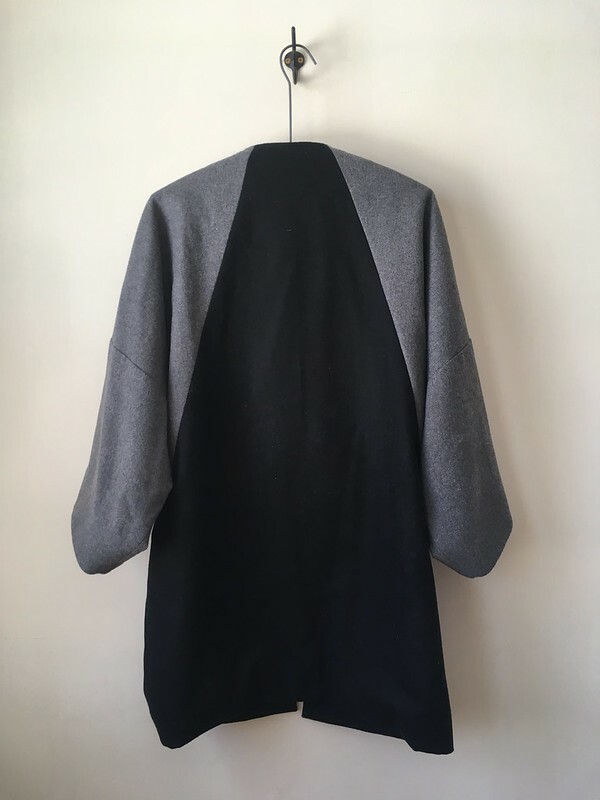 I saw online that many people used different tailoring techniques and interfacing to make this more like a coat, and less like a lightweight jacket, but I decided to mostly trust and follow the instructions as written. The one thing I did change was the sleeves. 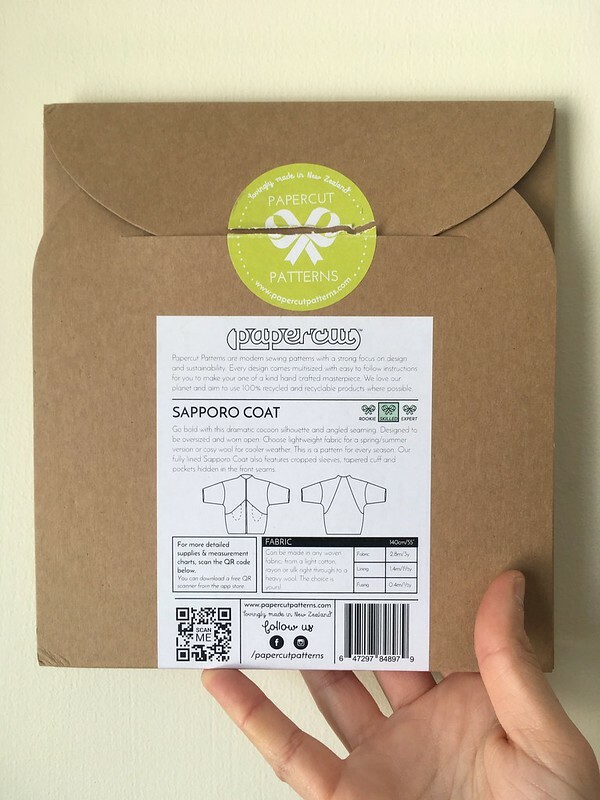 The pattern has you line the sleeves with the same fabric as the outside, but I noticed that the seam that joins the sleeves to the body really stood out from the body on many Sapporo coats that I saw online, and I hoped that using lining in the sleeve would soften that area so it didn’t stand up so much. It didn’t actually have the effect I had hoped for, but I did learn how to bag a lining after a few missteps. 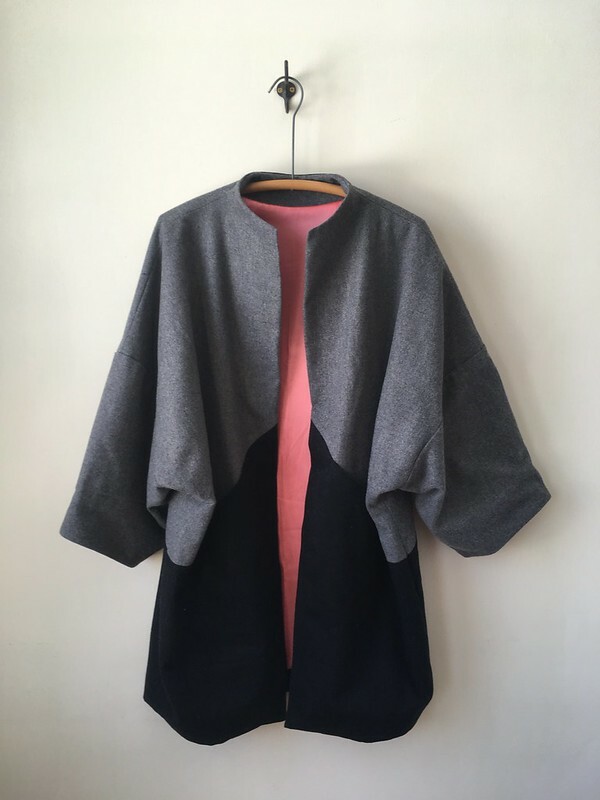 I really like this strange and interesting coat. 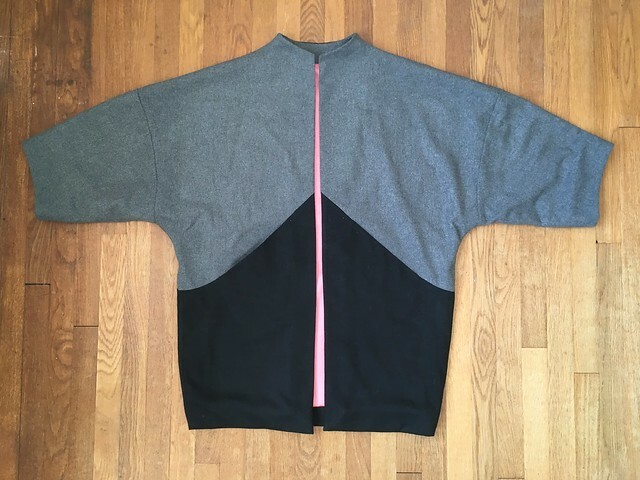 I like the hidden pockets and the unique shape. 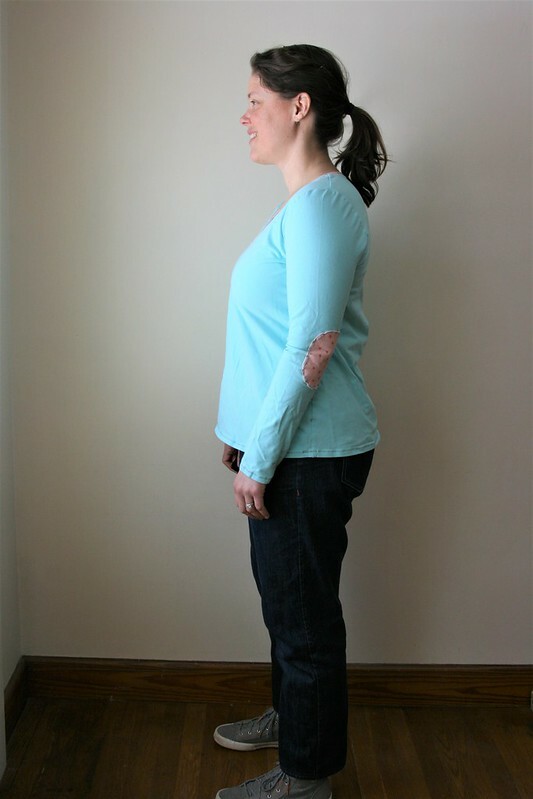 I wasn’t sure if I would like the shorter sleeves, but I do. They work with the silhouette. And I LOVE the color-blocking. 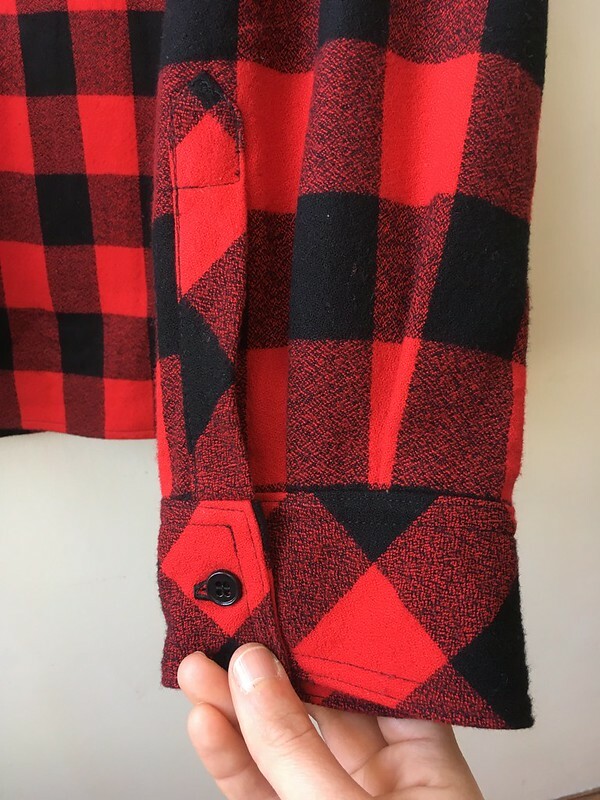 Originally I had planned to do a lot of topstitching, but decided against it when I started making the jacket. I still think it would be interesting to add topstitching near the seam lines and edges, but that will have to be an experiment for another time. 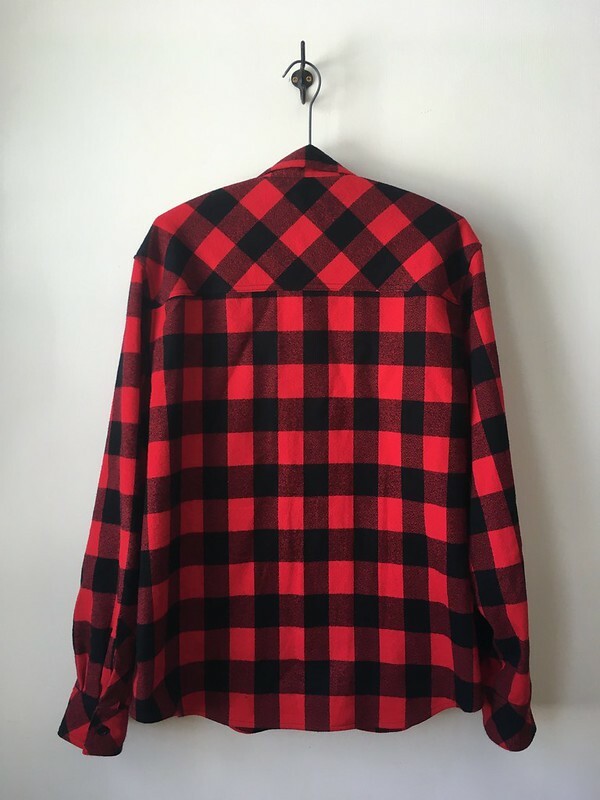 The top of the collar seems like it wants to roll out, so topstitching would probably help with that. It will be interesting to see if this jacket becomes a staple of my wardrobe or more of an occasional piece. I really enjoyed making it and would consider making it again someday. 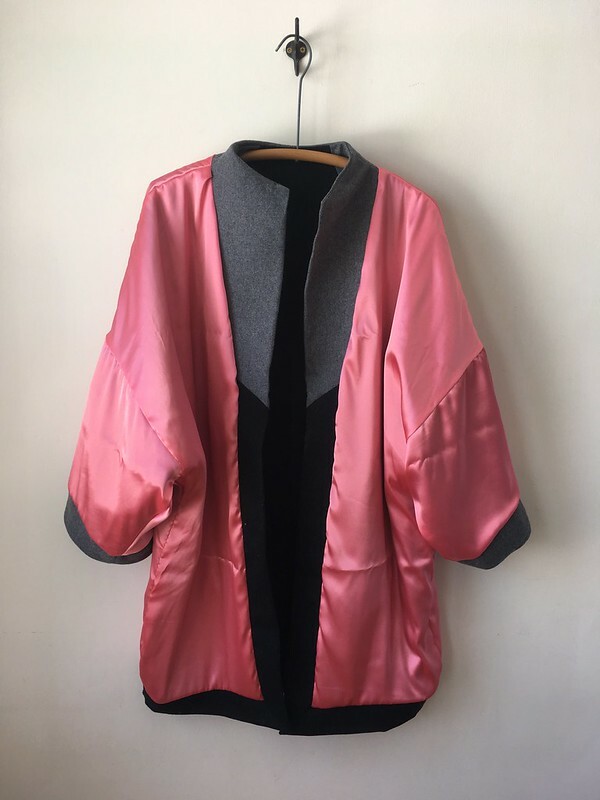 One of my goals is to make more jackets in general, so this is a good start. 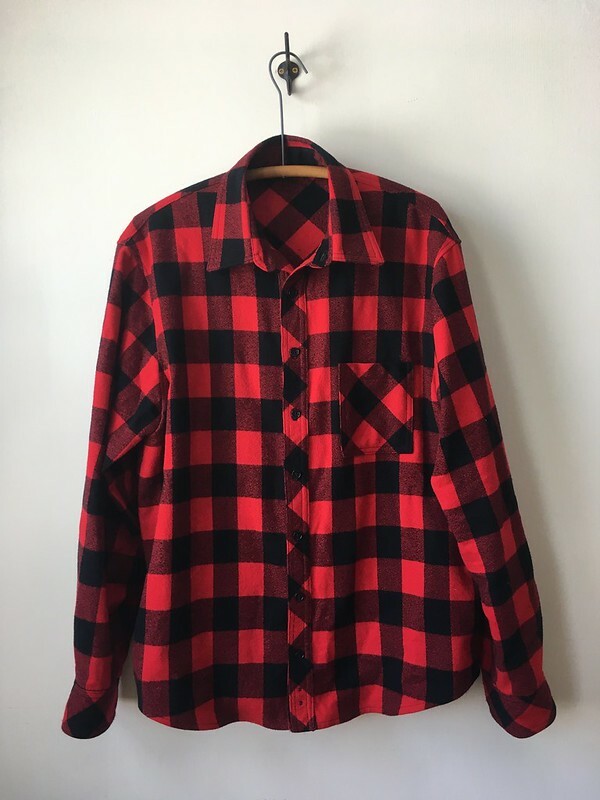 I am so happy to report that this flannel shirt, which was supposed to be a Christmas present in 2017, is finally finished! It took awhile, but I’m really happy with the final result. 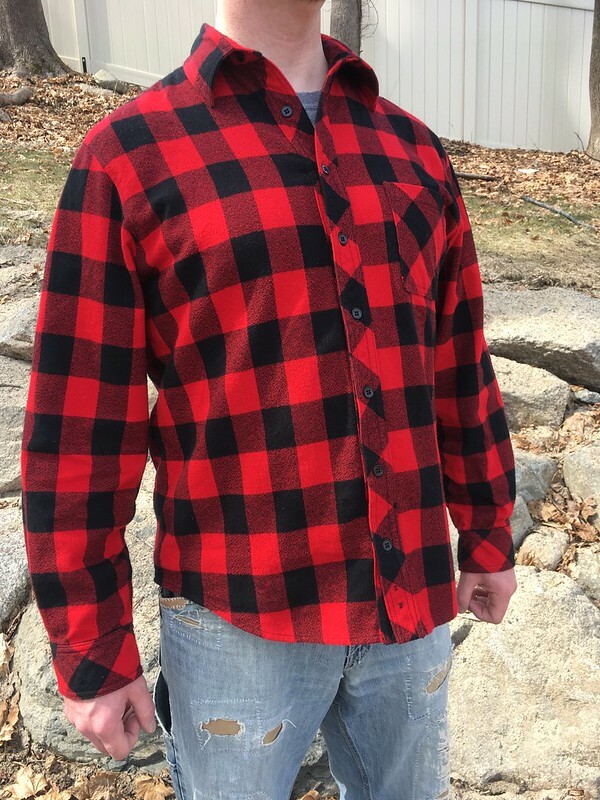 My husband picked out this buffalo plaid Mammoth Flannel by Robert Kaufman Fabrics in 2017, and we decided to pair it with the Thread Theory Fairfield Button-up Shirt. The Fairfield is a slim-fitting dress shirt, which should have been a clue about how my initial tests would go. 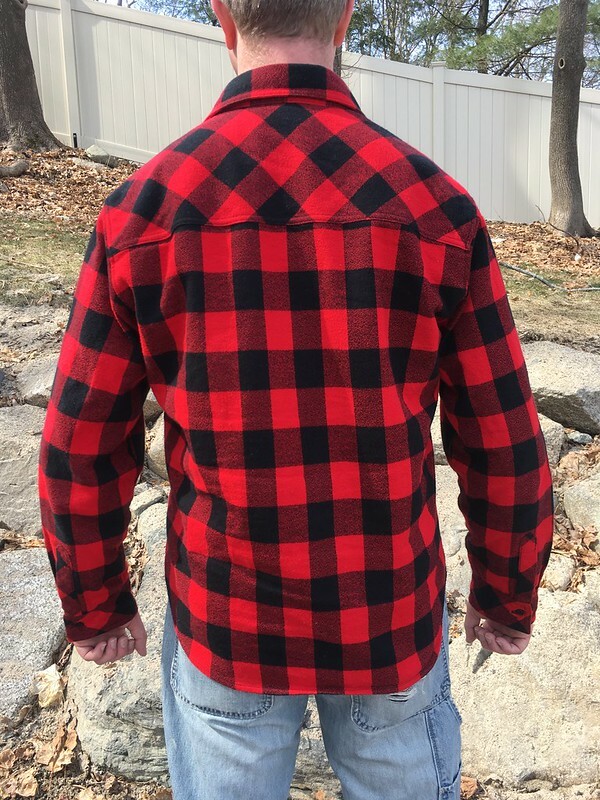 What my husband wanted was a loose-fitting, casual flannel shirt. 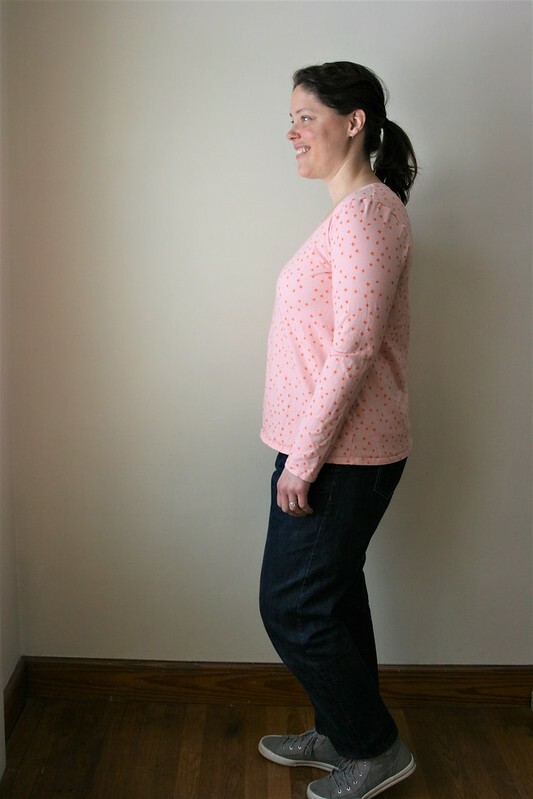 We really like Thread Theory Patterns, which is why we tried the Fairfield, but after two muslins (test garments), it just wasn’t working out. I made muslin #1 too big. Muslin #2 was a great fit…for a slim-fitting dress shirt, which is exactly what that pattern is for. What it is not is a loose and boxy casual button up. After two muslins, I put the pattern away for a year. I needed a break. This past fall/winter, I decided to try again. 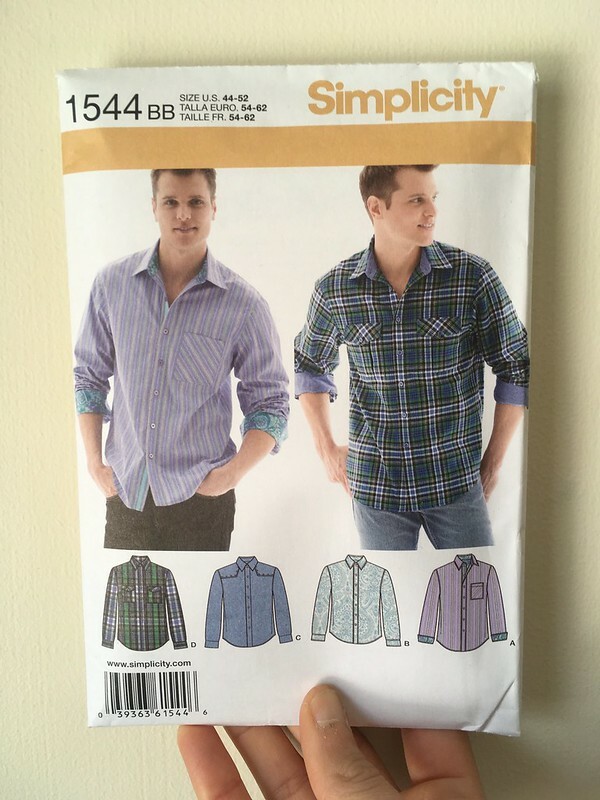 I bought Simplicity 1544, which is the men’s version of my own favorite button up pattern, Simplicity 1538. 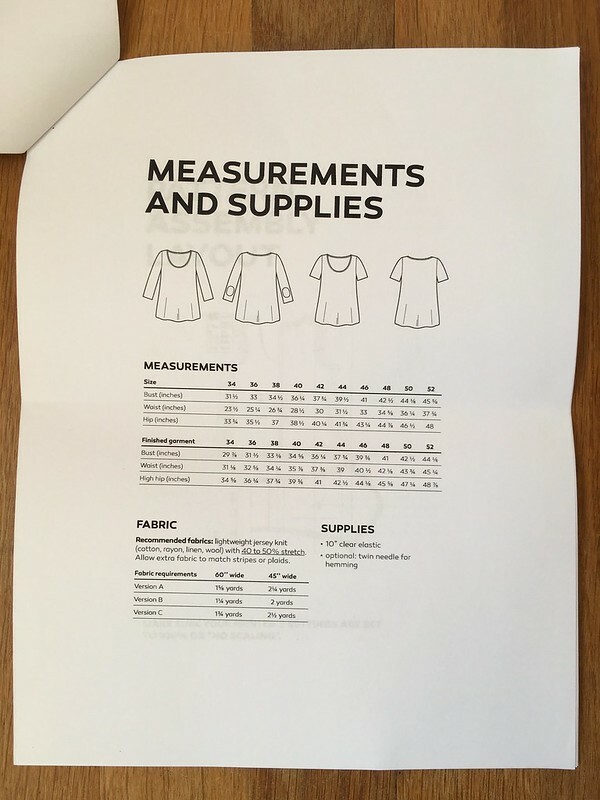 I took my husband’s measurements, which put him in a size 44. I cut out a straight 44 for him (View A without the back tab), and decided to throw caution to the wind and skip the muslin. I really hate making muslins despite the fact that I’m always glad when I do. After two, I just decided I was going for it and if it didn’t work out, we could find someone else to give it to. It was time. I took a lot of time and care in cutting this shirt out. 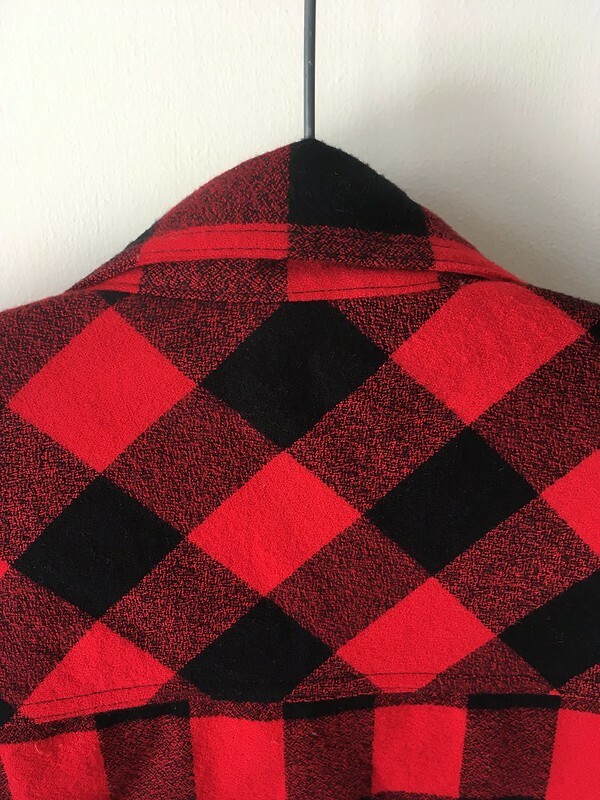 The blocks of color in this plaid are more rectangular than square, so there are some areas that I couldn’t make symmetrical, specifically the back yoke, which I put on the bias, but overall, it worked out great. 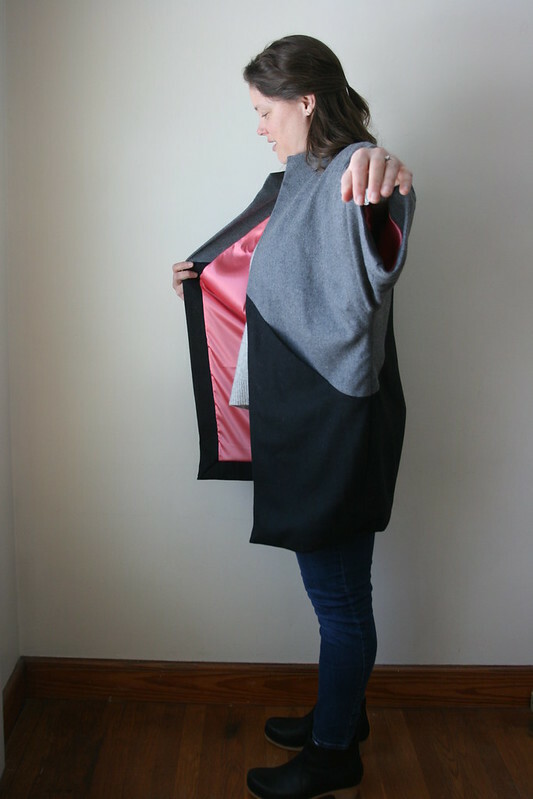 I love contrast, so I used the bias as my contrast, in a sense, putting it on the yoke, the front placket, the pocket, cuffs, and cuff placket. 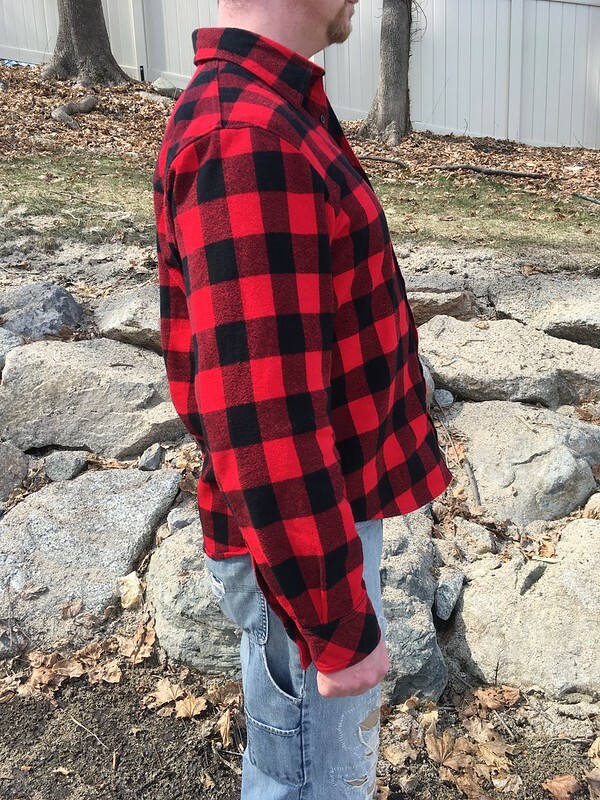 I tried to match the plaid horizontally across the front of the shirt, the back, and across the sleeves. I was even careful to have the shirt’s hemmed edge fall at the bottom of a repeat (this was mostly successful). And tried to have a dividing line of the plaid down the back center of the collar and collar stand. The yoke, placket, and cuffs, however, are satisfyingly finished. And the topstitching is a really nice detail. I was surprised at how much I enjoyed sewing this pattern. 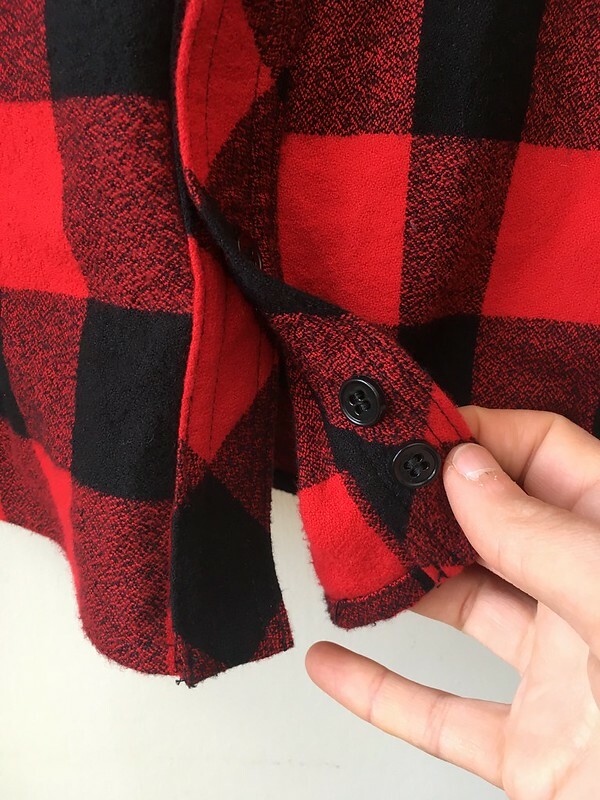 I shouldn’t have been–I really like making button up shirts, but after taking such a long time to get to the sewing part of this project, I wasn’t really thinking about how I would feel while sewing. Happily, I loved it. 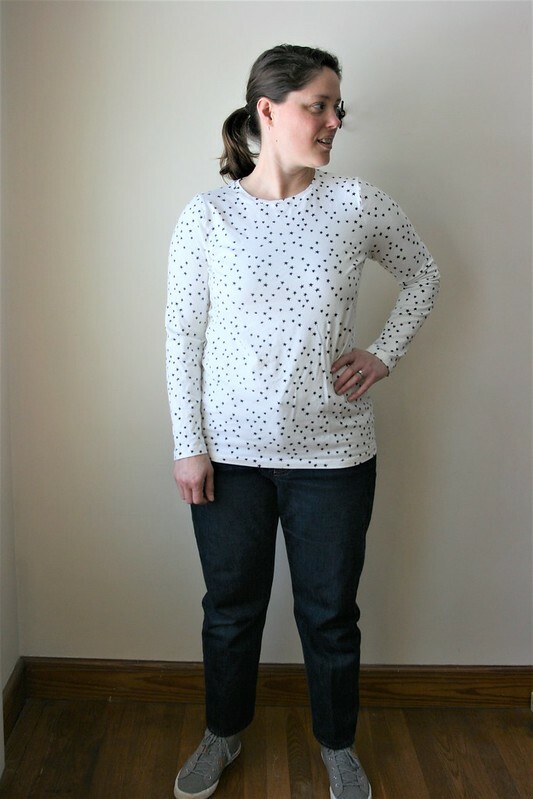 The directions for this pattern are clear and well-written, and I loved seeing all my careful cutting come together is a beautifully matched shirt. The icing on the cake was that this was exactly the fit my husband was looking for. 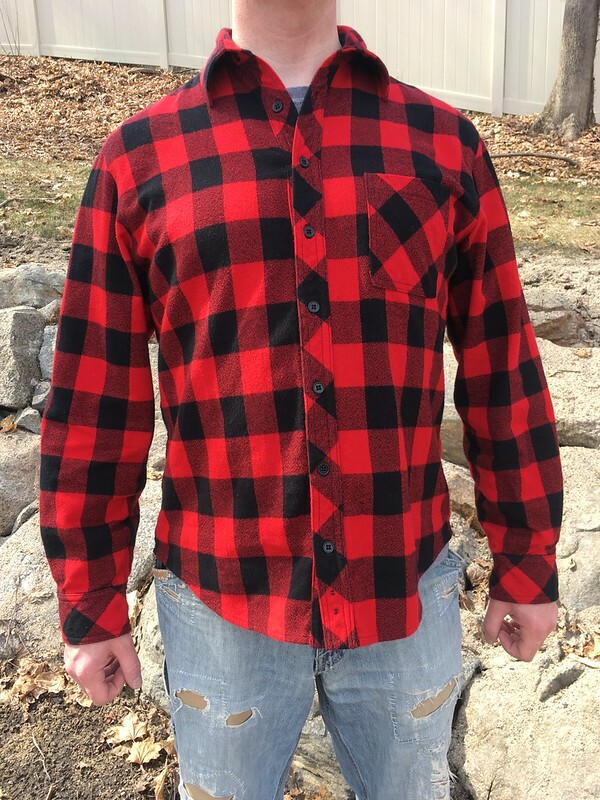 It’s the perfect casual flannel shirt for him. 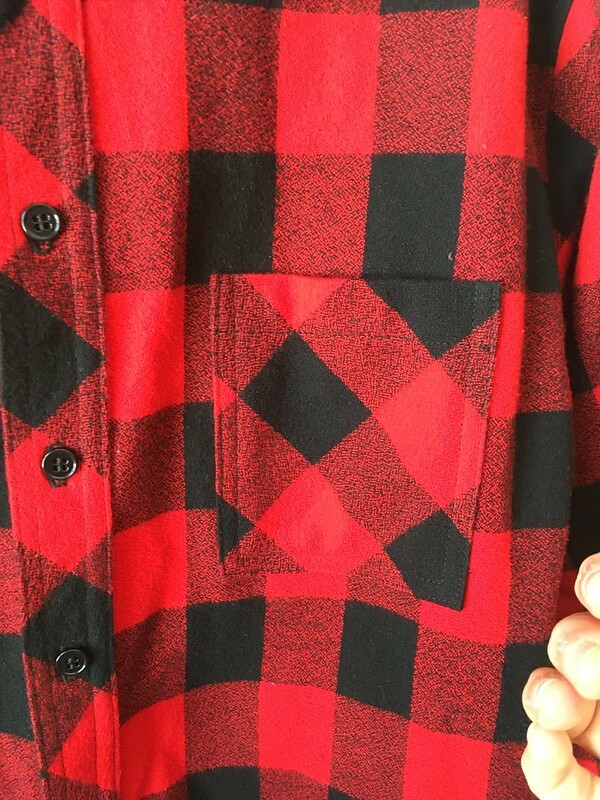 This pattern is going to be my go-to if I make him any other casual shirts. 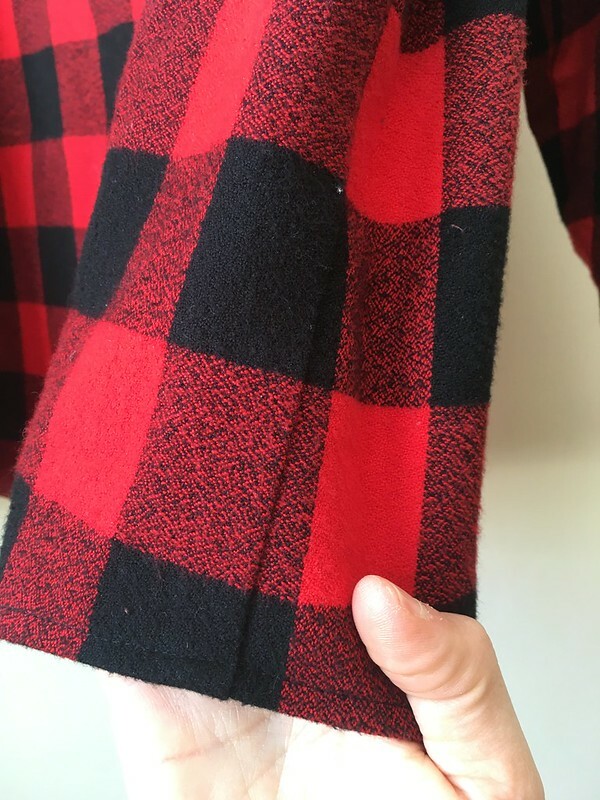 As far as the fabric, my love of Robert Kaufman’s Mammoth Flannel is pretty well documented (here’s my Mammoth flannel version of Simplicity 1538), and this is no exception. 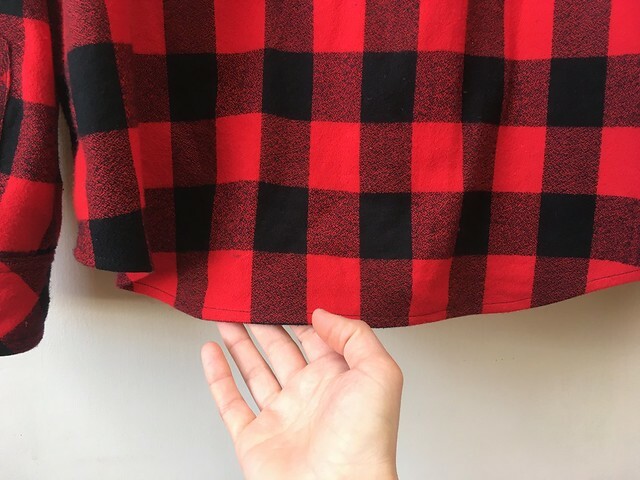 When you buy it, it feels a little on the thin side, but as soon as you wash it, it fluffs up to be nice and substantial, with no real right or wrong side. I like Robert Kaufman fabrics in general because there is a huge variety of substrates and styles, lots of shops carry Robert Kaufman fabric, and it’s both good quality and affordable. 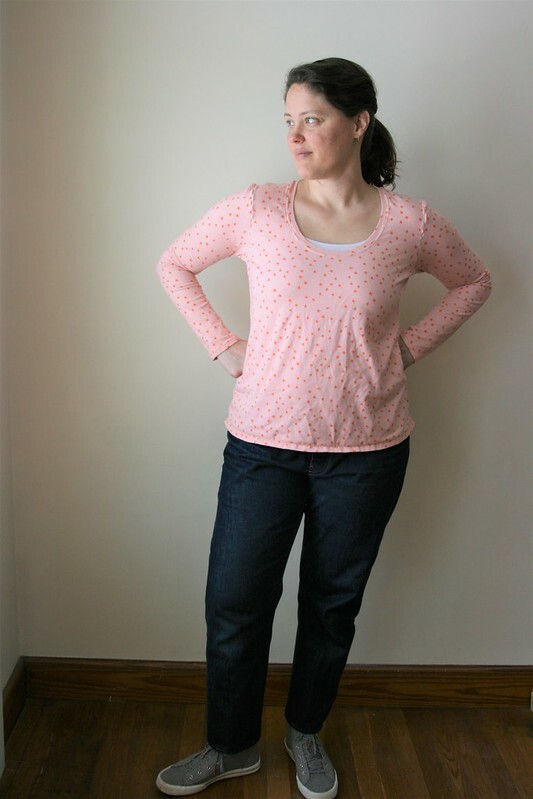 This fabric and the Fairfield Shirt pattern came from Pintuck & Purl (of course) and the Simplicity pattern came from Joann’s, as did interfacing and thread. The buttons were given to me by a friend. They are basic black buttons, but are a perfect match. I made sure to put a few on the inside of the placket in case any of the main ones fall off. It’s finally spring! 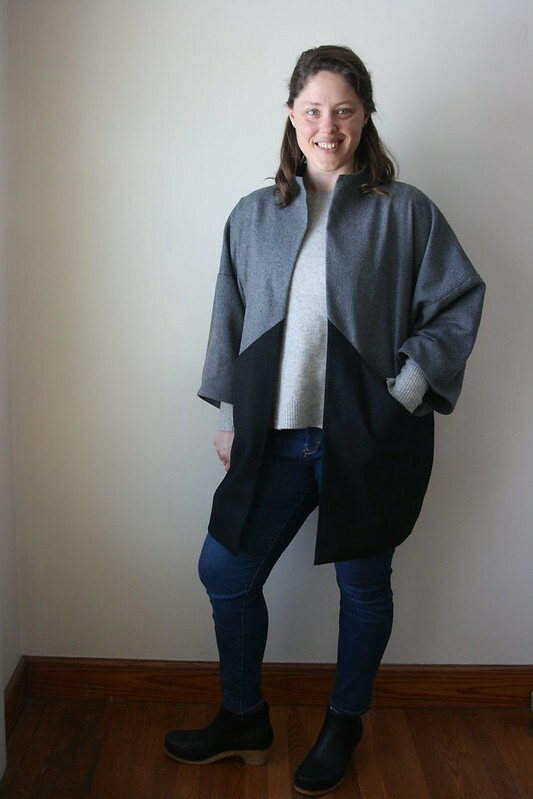 I’m so ready for it, but before I start digging into spring projects, I have some winter garments to talk about on the blog. 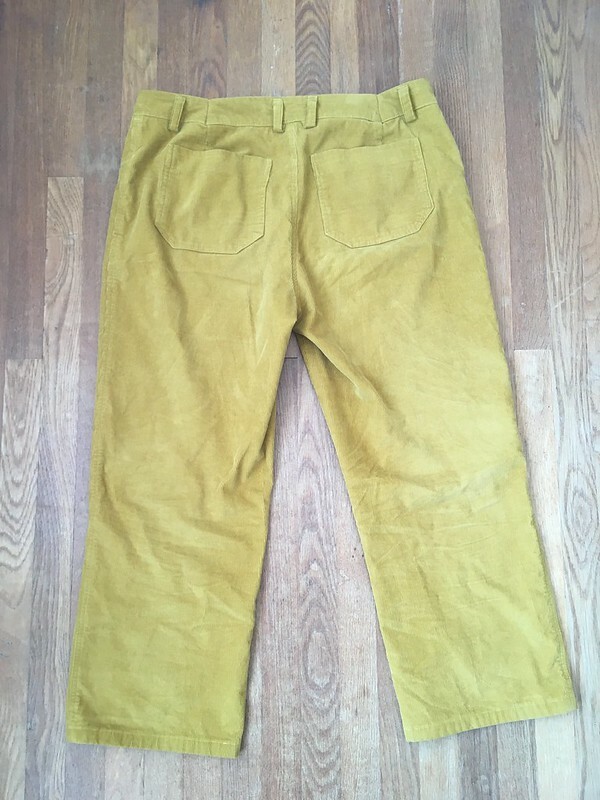 One of those garments is a pair of Jutland Pants for me in yellow corduroy. 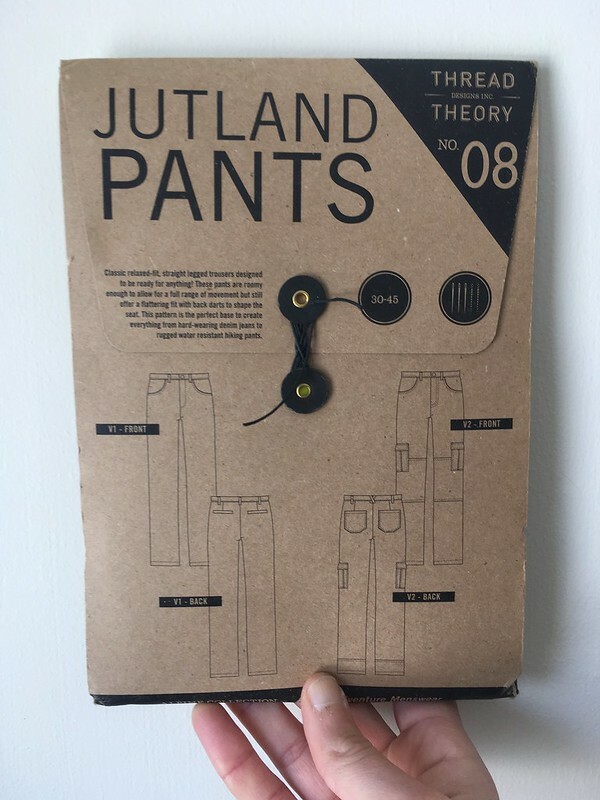 The Jutland Pants are a men’s pants pattern by Thread Theory. I’ve made a few pairs for my husband (here and here), but they also miraculously fit me (see my first pair and my cutoffs). And, like any good pair of boyfriend jeans, they are loose and comfy. This time around, I had to trace a new size, but I was in the middle of two sizes, so I tried to trace right in between the size lines on the pattern sheet. I’m always afraid of making things too small, so I tend to err on the side of bigger rather than smaller. 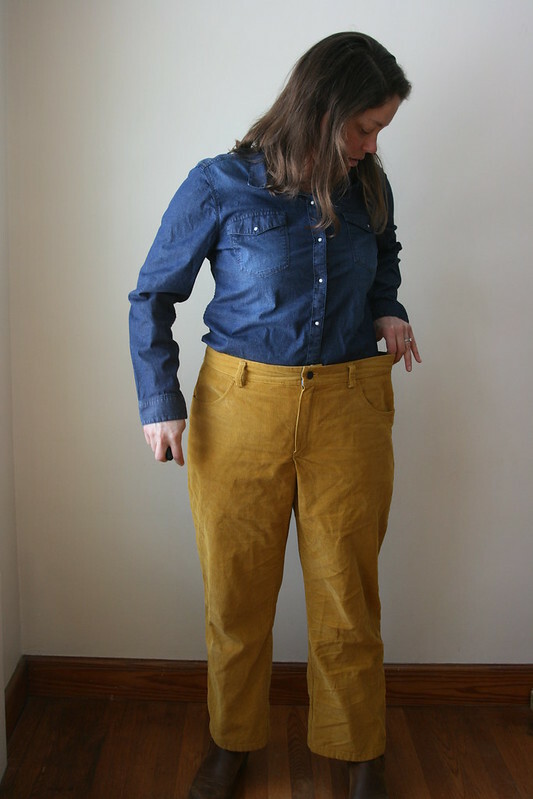 With this iteration of the Jutland Pants, I think I went just a little too big. 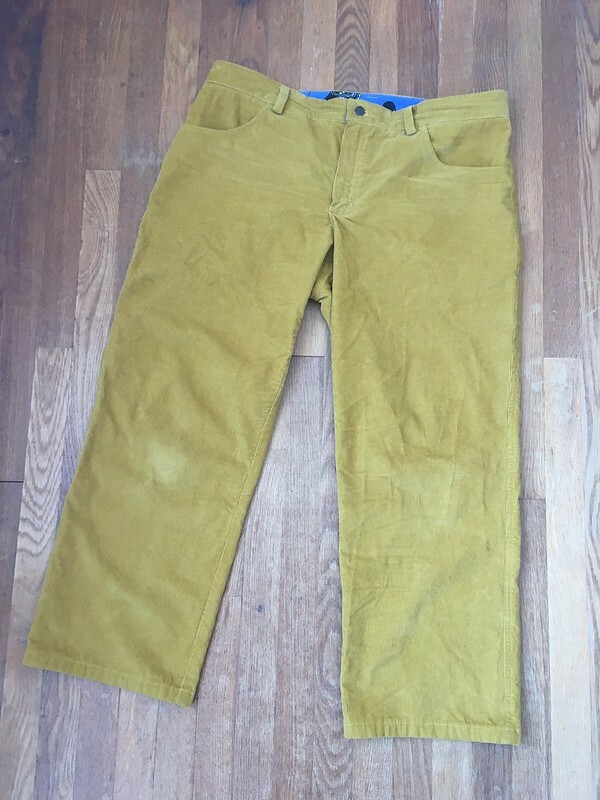 The pants, which are SO comfortable, are also super loose, and definitely a bit bigger than they should be. You can kind of see below that there is a bit extra in the waistband. 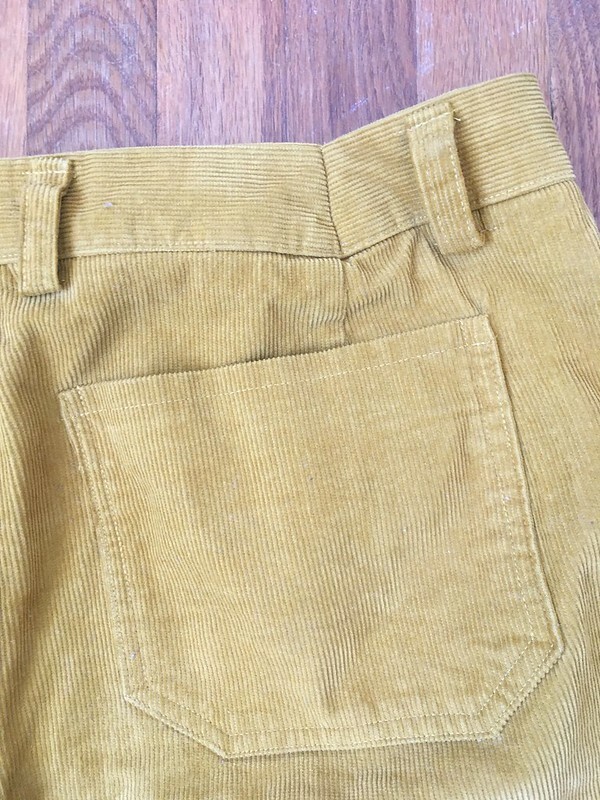 When I first put them on, the waistband really stood away from my body at the back, so I put in a few darts after they were otherwise finished. I tried to line up the waistband darts I was creating with the darts that were already in the back. I transferred the darts to my pattern piece for the future. I also came to an important conclusion: if I’m going to keep making this pattern for myself, it’s time to get serious about making it actually fit me. As far as this pair goes, I love them. I recognize that they don’t look great on me, but they do feel great. I’m so ready for pants with wider legs. All that being said, however, I plan to make the next pair a bit smaller and do some real work on the pattern to make it fit me just right. 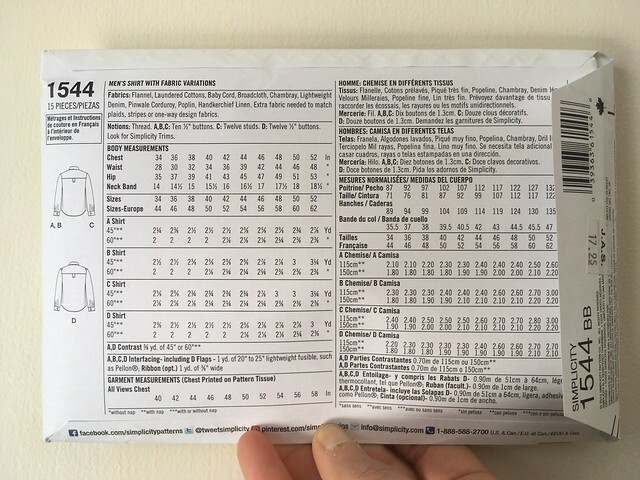 I’m even researching possible ways to make the waistband adjustable for weight gain or loss (seriously–why is that not standard on all pants?). 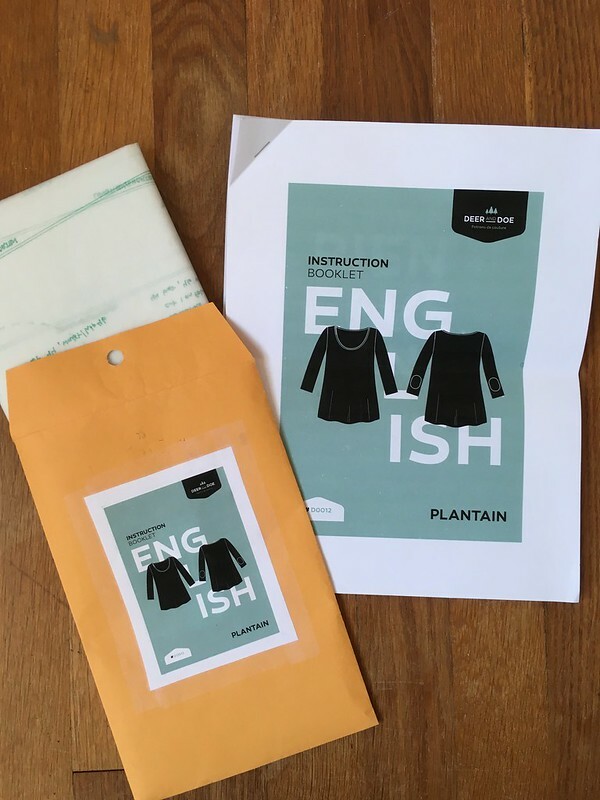 I got my pattern and fabric from Pintuck & Purl. 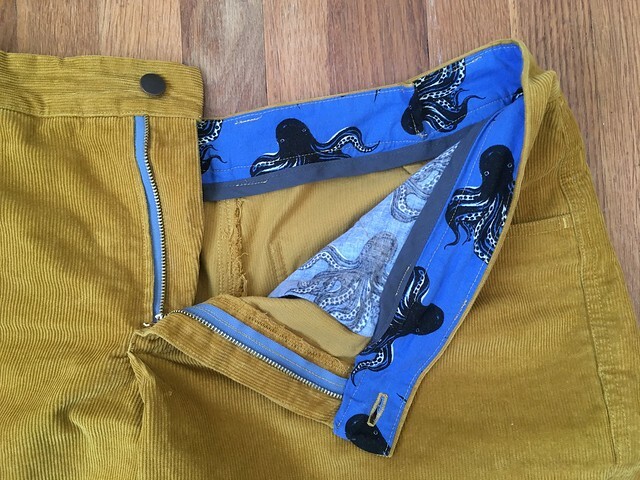 The corduroy (a Christmas present) is a Robert Kaufman corduroy, and the octopus fabric I used for the waistband and pockets is an old Cotton + Steel quilting cotton print. Other supplies, like bias binding, thread, and interfacing came from Joann Fabrics. I mainly followed the directions, with the addition of the darts and an extra bar tack at the bottom of the fly. One weird thing about this pattern is that it creates a small fold at the bottom of the fly, rather than a smooth surface. Has anyone else experienced this? Am I missing something? It never bothers me when I’m wearing it, but it always leaves me nonplussed when I think about it. 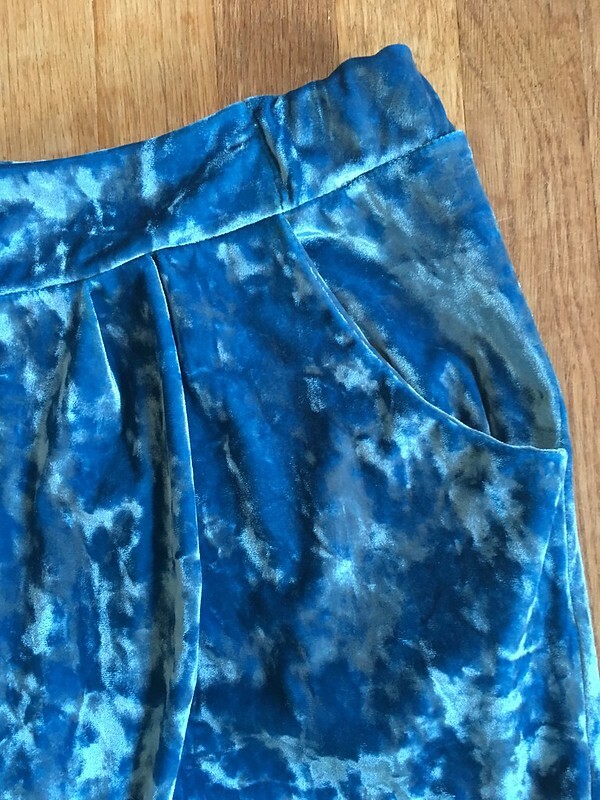 I used faux flat-fell and zigzag stitching on the seam allowances inside to finish my seams, so they aren’t very pretty, but it was quick. 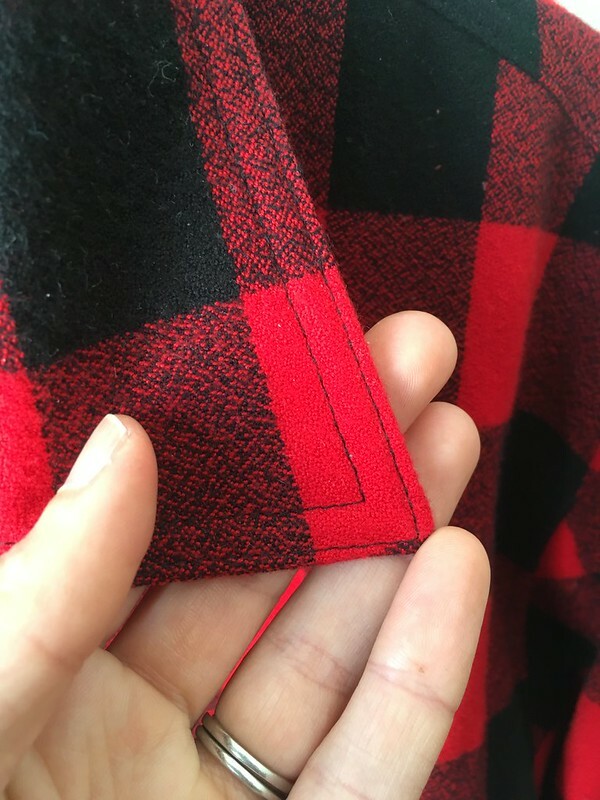 There is provision in the pattern for nice, flat-felled seams if you want them, though. In order to do that, you should follow the construction order in the pattern. 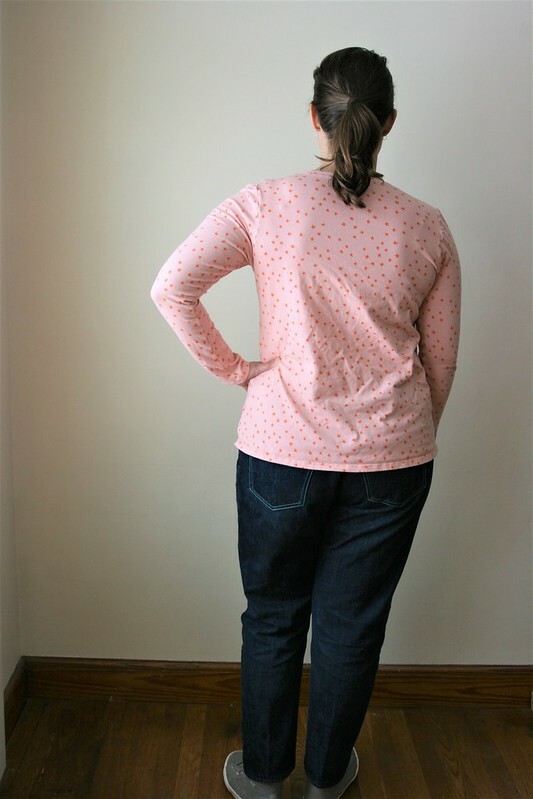 In future, though, (if I remember), I plan to skip that and construct the front and then the back, like the Ginger Jeans, so I can fit from the side seams before finalizing everything. Those are my current thoughts on this pattern. I think my great love for it comes from its comfort and the straight leg shape. Hopefully I can get it to really work for me. It’s been awhile since we had a good ol’ Craft Fail on the blog, but this project was a complete and total loss. I would say that three-quarters of it was my fault–poor fabric choice, and silly mistakes were most of the problem. I also had some trouble with the directions. 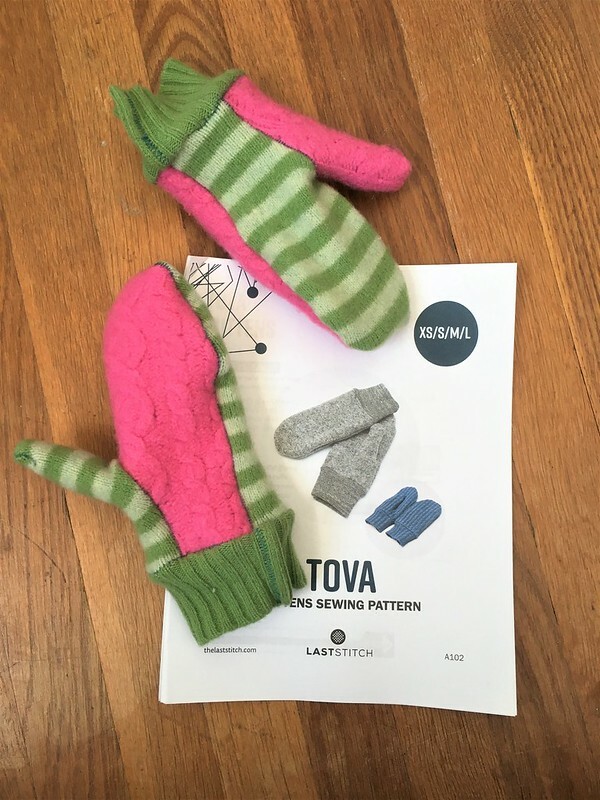 I bought this pattern, the Tova Mittens, along with two hat patterns, from Last Stitch during the Black Friday sales. 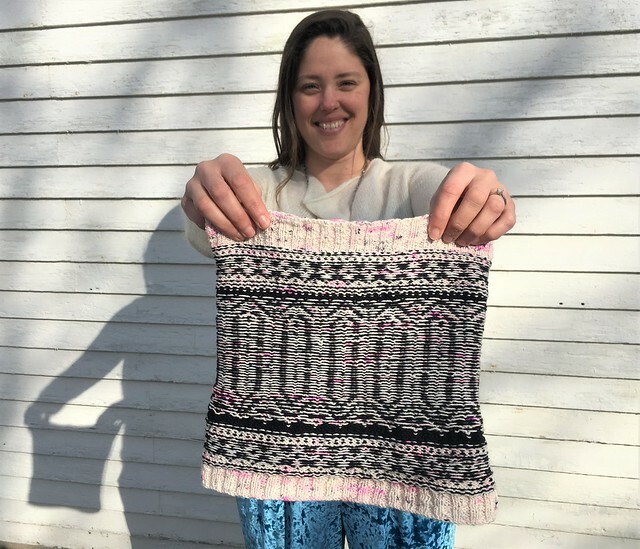 I was really excited about these patterns (and I still am), partly because it looked like you could use shrunken/upcycled sweaters to make them. 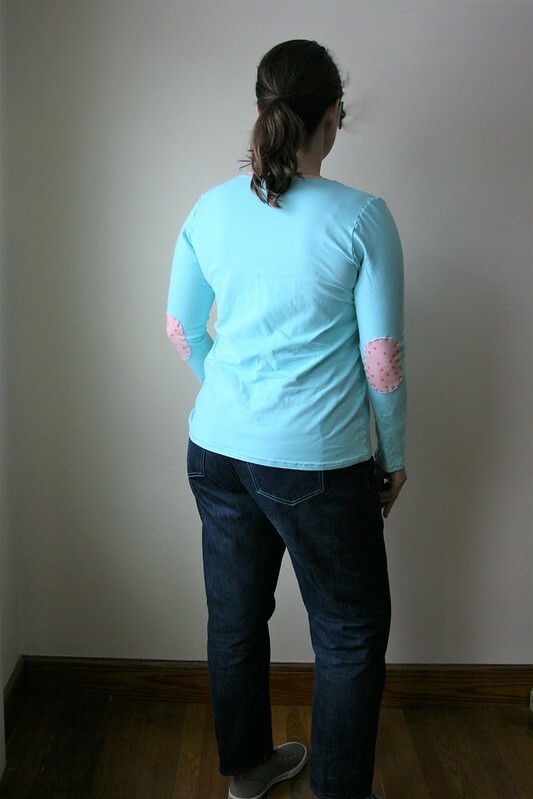 This seemed like a fun way to use up some of my favorite shrunken sweaters, which I save for interesting projects like this. The intended recipient and I went through and picked out a fun combination of sweater pieces so that I could make mittens that would sort of match in an offbeat way. 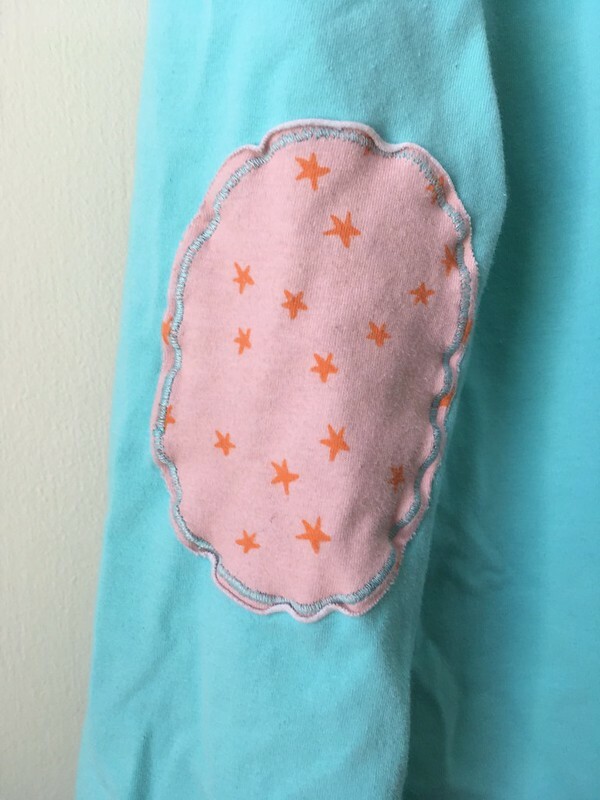 I also had a few scraps of sweatshirt material (from this project) that I thought would be perfect for lining. I think problem number one was the fabric choice. The shrunken sweaters, specifically the pink sweater, weren’t as stretchy as they probably should have been. Another VERY IMPORTANT thing that I didn’t pay enough attention to was the right side of that pink sweater fabric. In its shrunken state, both sides look really cool and could have been used as the right side. 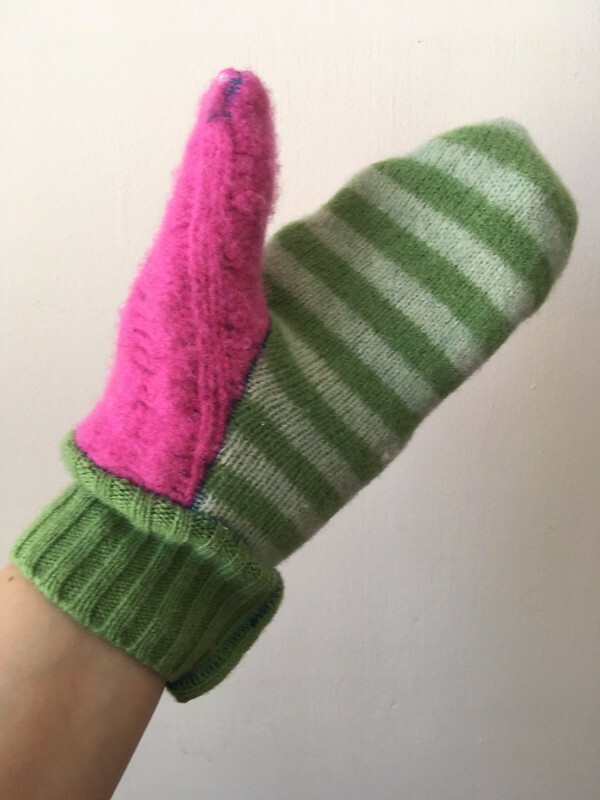 Sadly I wasn’t careful enough when cutting and sewing…and…I MADE TWO LEFT-HANDED MITTENS. Yes. I did. 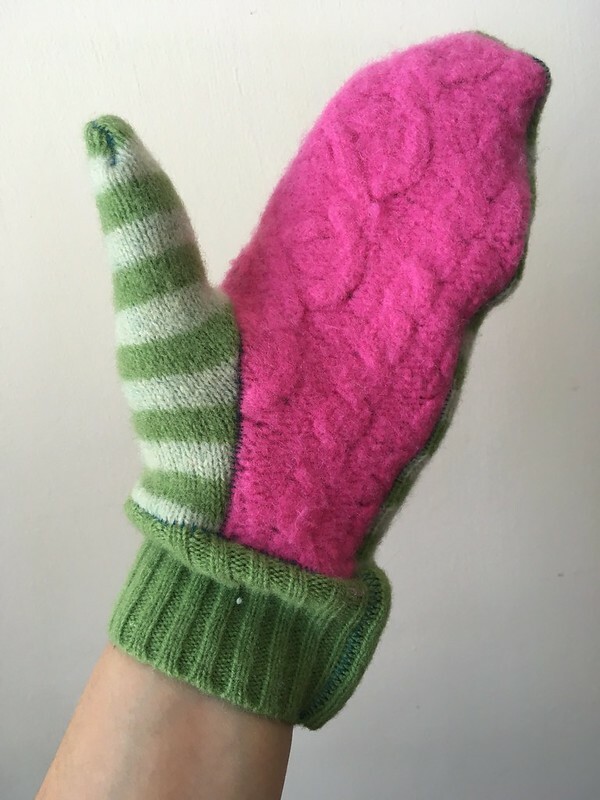 And to ice that cake, (and probably because of it), one of the lining pieces on one of the mittens is the wrong way out. Bad, bad, and worse. Also funny…once you stop being mad. The pattern itself is interesting. I made the XS size. 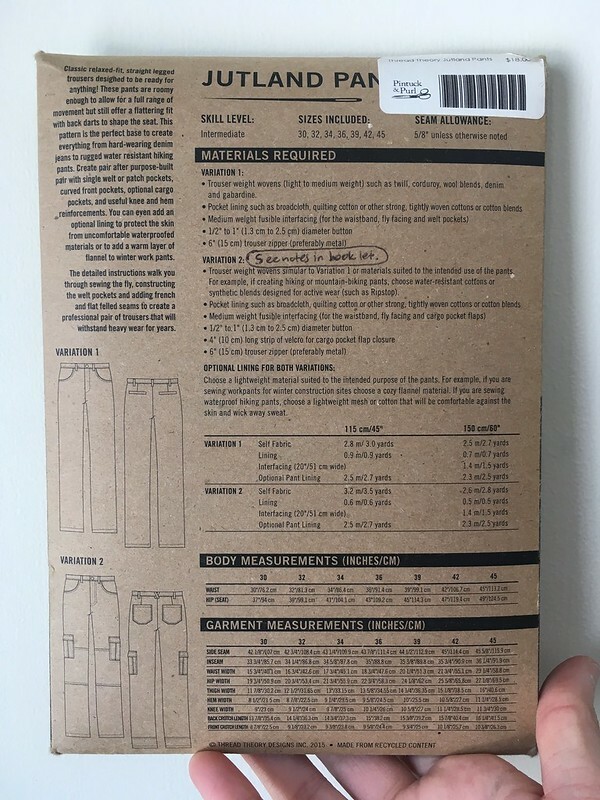 The seam allowance is odd if you use Imperial measurements. For those of us who use inches, it’s 1/5″, which I’ve never seen before, so I just tried to use 1/4″. I was tracking with the directions until step 5. I found the picture really confusing. I ended up sewing the thumb right sides together and then turning it right side out before doing the next step. Then everything was good until step 8. 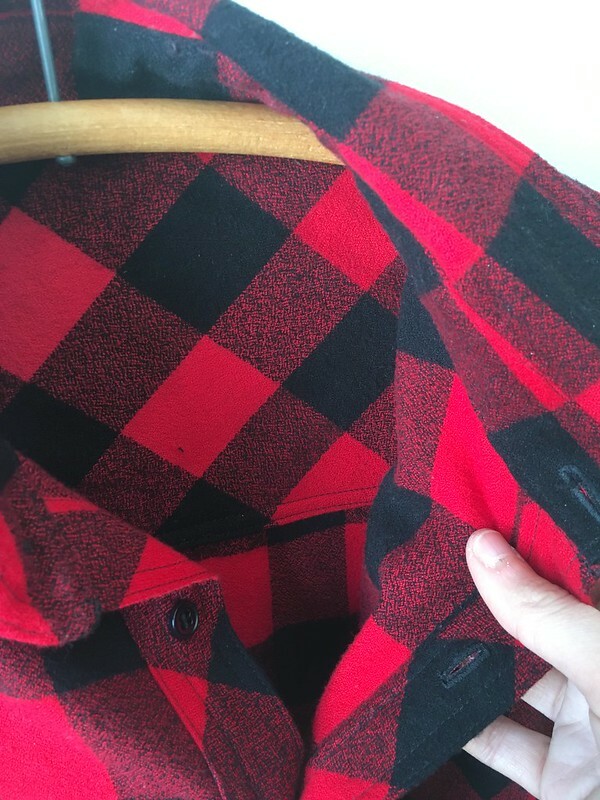 I stitched the front and back together with right sides together, which meant that my thumb was on the inside, and I had to be careful not to stitch it. This is different from the picture (adding to my confusion), but maybe I did step 5 wrong. 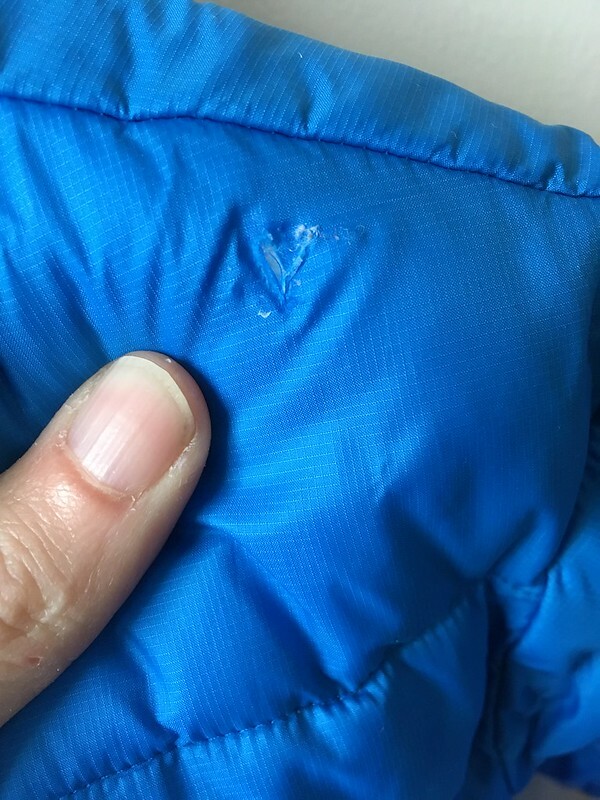 I could also see that I was going to have a hole where the thumb joined to the side seam. Once I got to the cuffs, I wasn’t sure if I was supposed to use the fold line shown on the cuff pattern piece in step 9 or 11. It wasn’t shown in the picture or mentioned in the directions. Step 11 was very confusing in general. 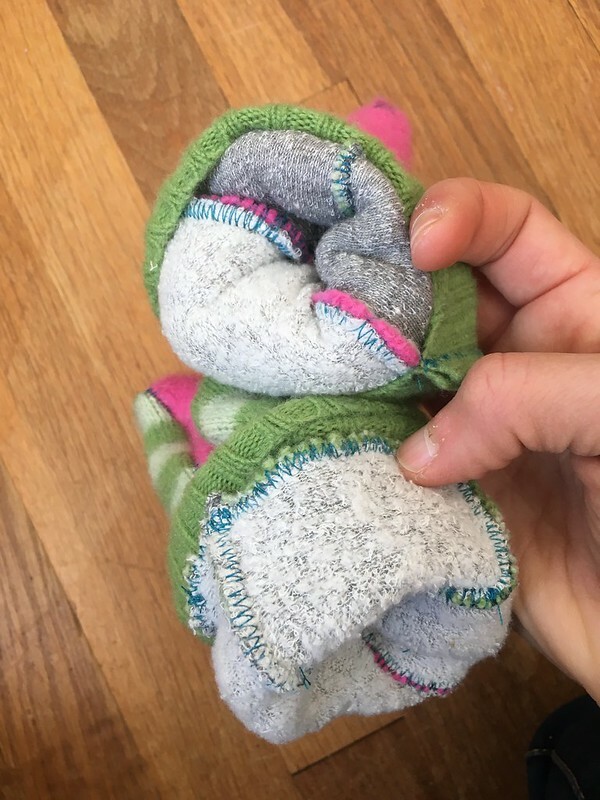 Was I supposed to fold in half what I had already done or fold half the cuff up so the seam was enclosed? 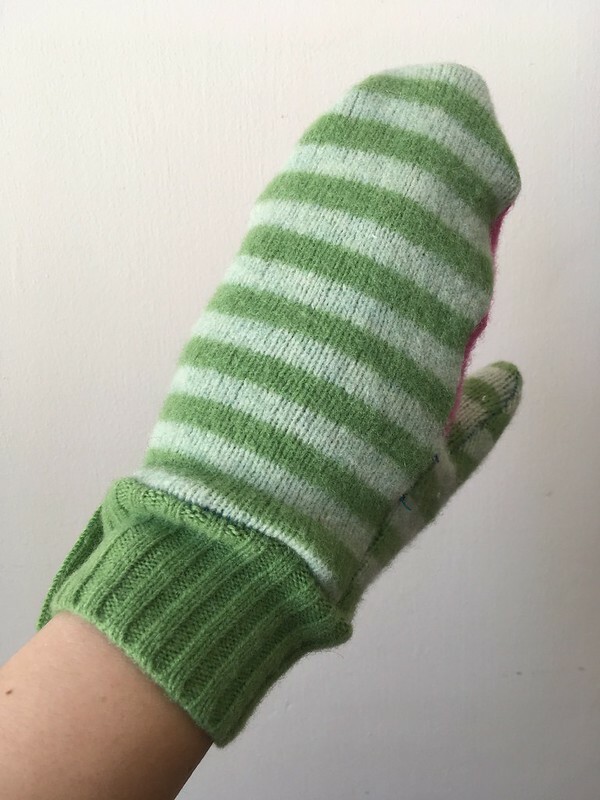 It didn’t end up mattering, because the cuff I had made was never going to fit the mitten. 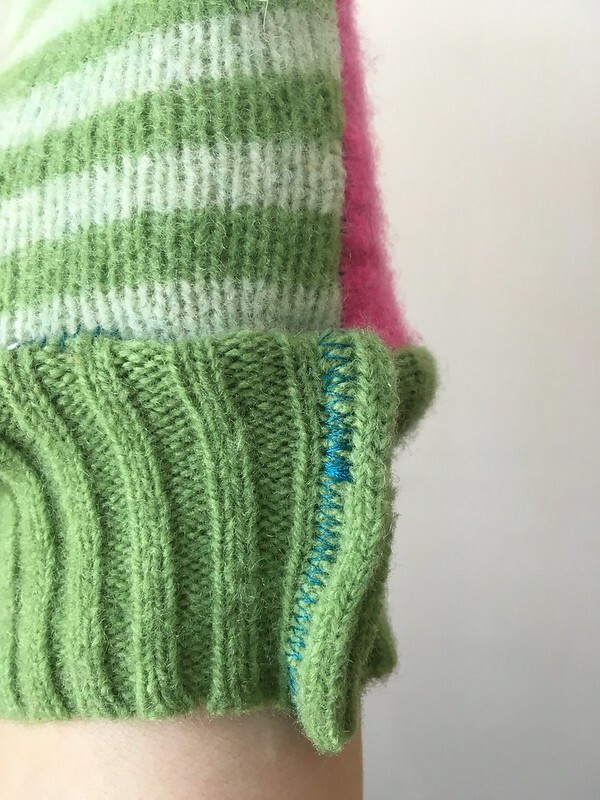 This was undoubtedly my fault–I’m sure my fabric wasn’t stretchy enough, so I chucked it and used ribbing from the green sweater, which worked much better. Unfortunately, I attached the cuffs wrong-way-out. Yep. I did. 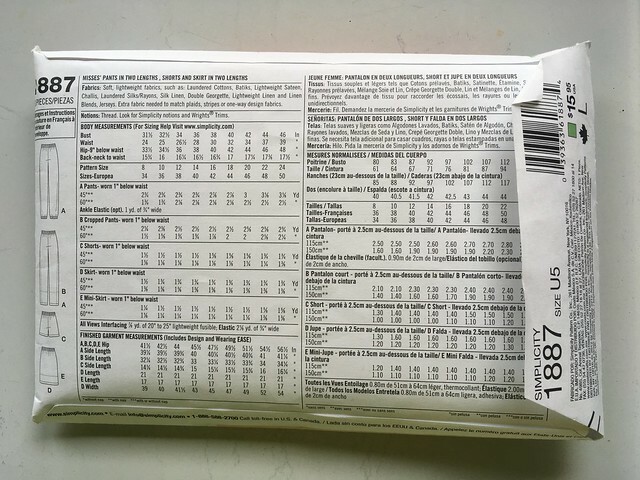 I think a big part of my problem in understanding the directions is that I’m coming at this from an American sewist’s viewpoint. We are used to having a lot of hand-holding. Even the Big 4 patterns, for as much as people complain about them, actually have a lot of information included in them if you take the time to read it. I think that sewists in Europe (where this pattern is coming from) who are used to Burda patterns are a lot more self-sufficient and used to figuring things out for themselves. While there actually are a lot of directions and illustrations, I found them hard to understand at several points. 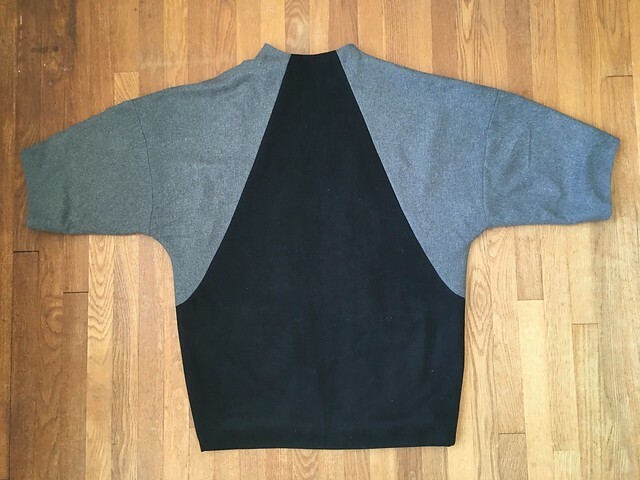 I would try this pattern again in a fleece with a distinct right and wrong side, and I think things would go a lot better, although I do wish the directions (pictures and words) made a bit more sense to me. 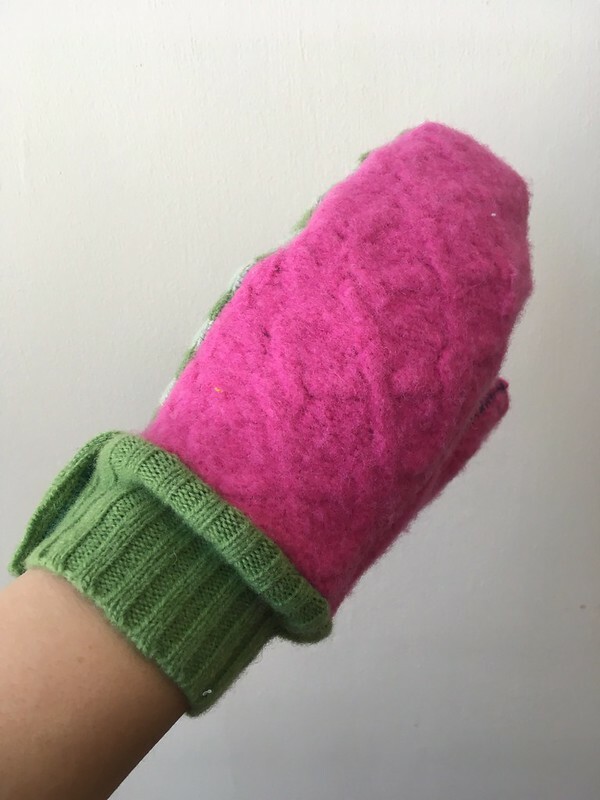 At this point, I have shoved these mittens in a corner, and will probably recycle them after publishing this post. On to the next thing! For Christmas this year, I got a skein of soft BAAH Sequoia yarn in the Dragontail colorway, a beautiful hand-dyed super bulky merino yarn. 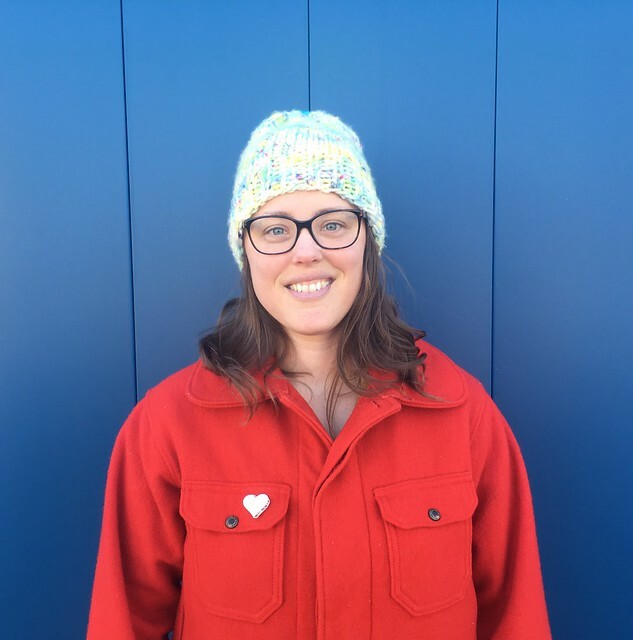 After seeing a sample of Sequoia knit into a Big Wool Basic Hat, a free pattern by Sara Heckman, I knew I wanted to make (at least) one too. 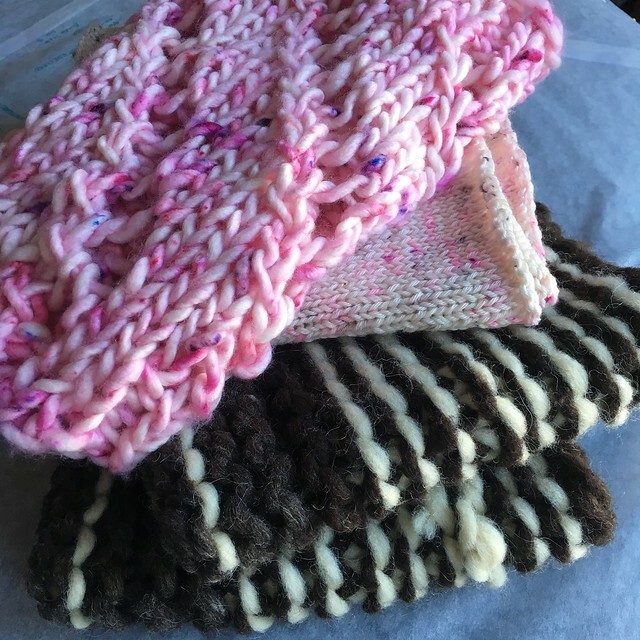 By the time Christmas rolled around, I was ready for some quick and easy knitting and sewing projects. This pattern was perfect. Knowing that I am a loose knitter, I took a chance and went down a needle size to US 13’s. I chose to use double pointed needles instead of circulars because I already had them. Using the size 13 needles, I got the right gauge. This pattern is basically a tube with ribbing at one end. Once you knit to the appropriate length, you run some yarn through the live stitches and draw them tight and tie the yarn off. It’s nice and easy and quick. 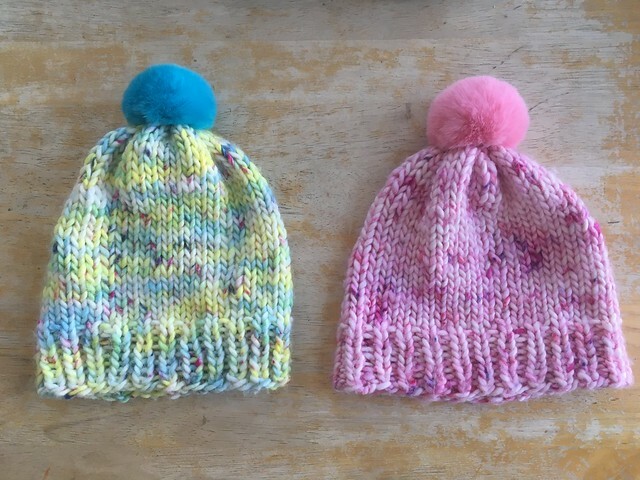 The length the pattern suggests knitting to is 10.5 inches, which I did on my first hat (on the right, above). 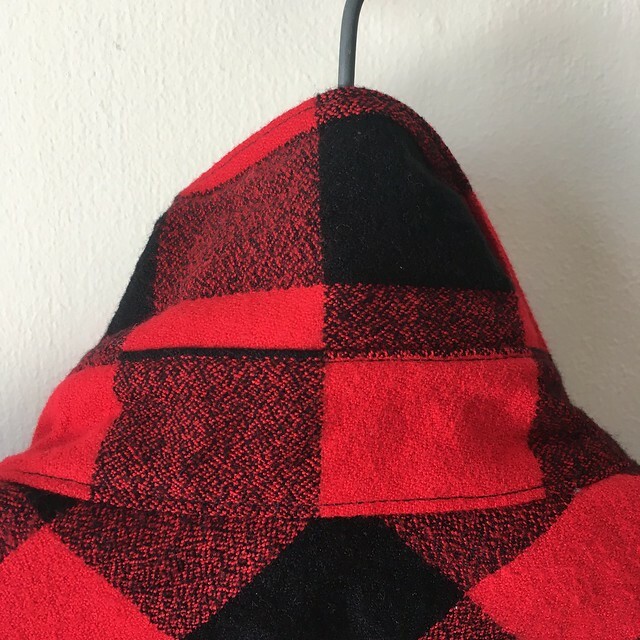 It makes for a hat long enough to wear slouchy or to fold up the brim. 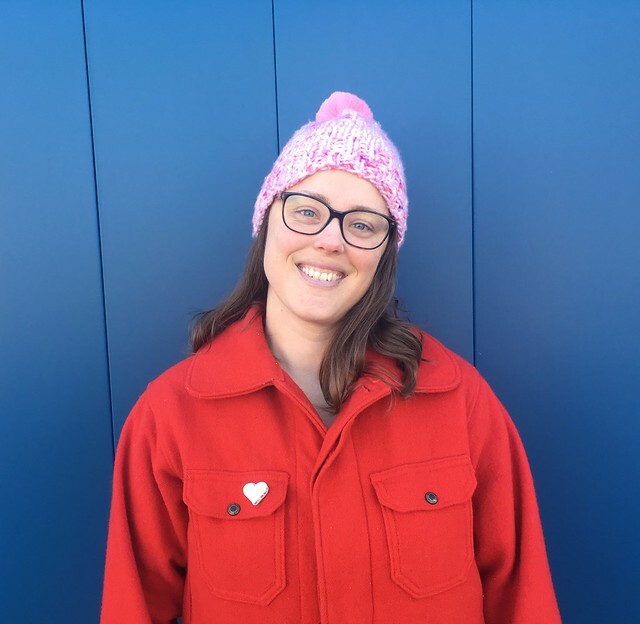 I was on the fence about this, so when I decided to knit a second hat by unravelling a previously made cowl, I made it shorter–only 9 inches long. This was the perfect length for me to wear the hat with the brim unfolded, which I like better. 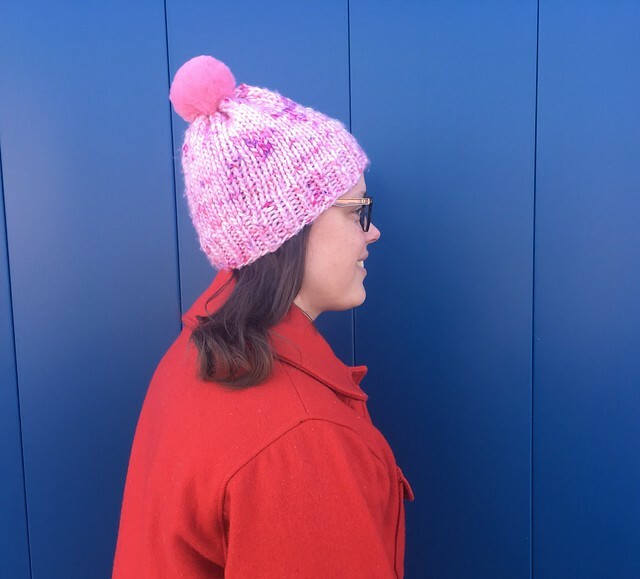 I wore both hats for a while and in the end decided to un-knit my first hat by an inch and a half so that it would also be 9 inches long. I’m really happy about that decision. 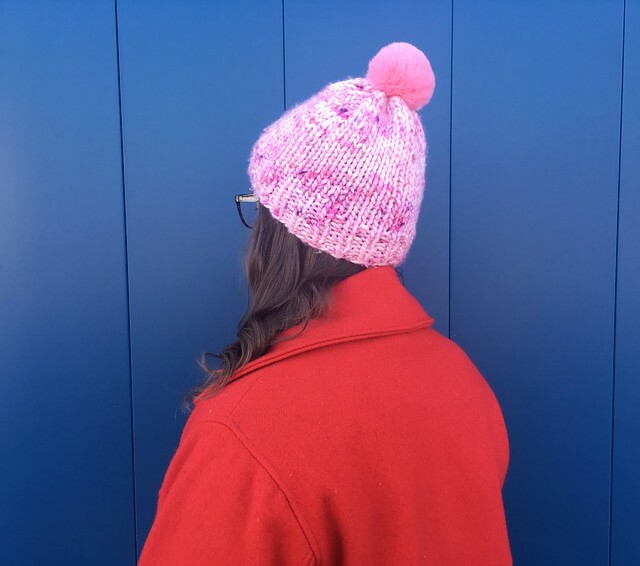 I bought a faux fur pom pom at Pintuck & Purl for my pink hat (also where the yarn and my other pom pom are from). It attaches with a big snap, which makes it easy to detach if you need to wash your hat. 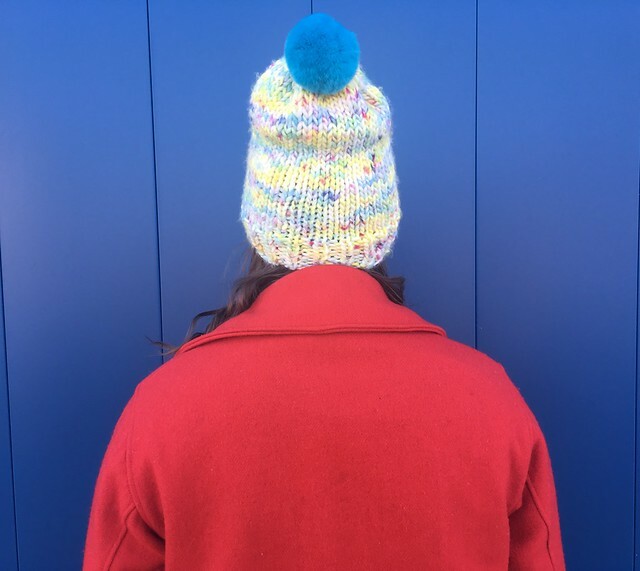 (You sew half of the snap to your hat–the other half is already attached to the pom pom.) 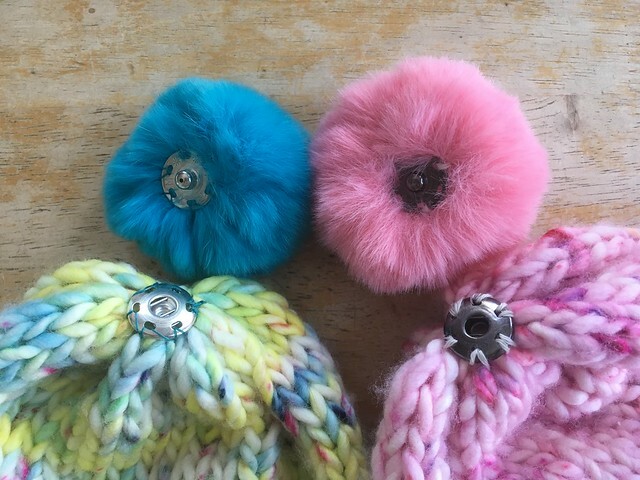 On the multi-colored hat, I had a rabbit fur pom pom that had a little elastic loop, kind of like a hair tie, so you can tie it into your hat. 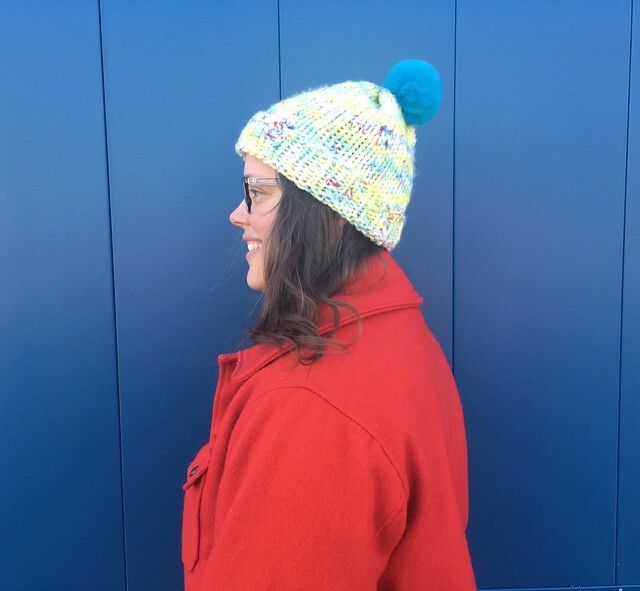 I liked the snap better, after trying both, so I bought some big snaps at Walmart and sewed one onto my multi-colored hat and turquoise pom pom, covering up the elastic loop. This makes for a much more secure attachment, and it’s easier to detach the pom pom now that it has a snap. I’ve been wearing these hats almost every day. 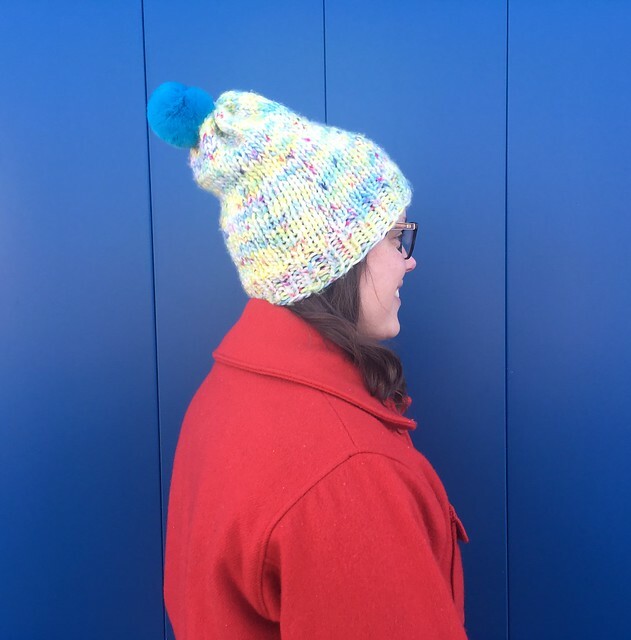 I love their bright colors and that this hat was so fast and easy to knit. I would definitely make this pattern with this yarn again. 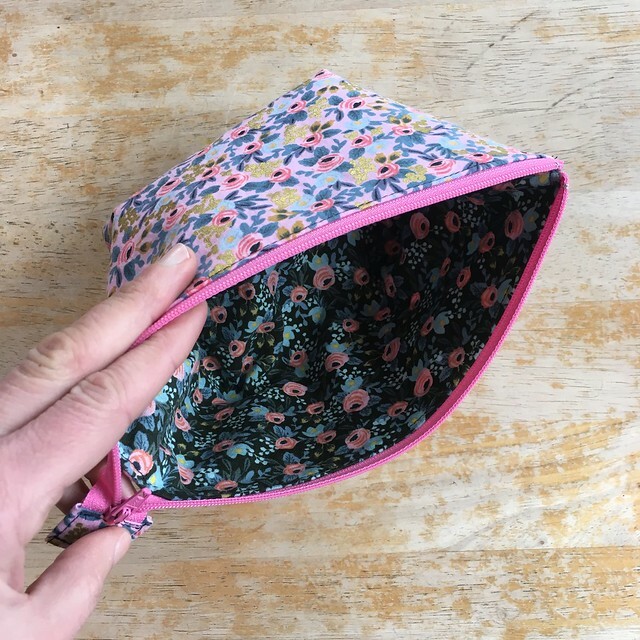 The Open Wide Zippered Pouch is a free tutorial from Anna Graham of the blog noodlehead. It comes with options for three different sizes. 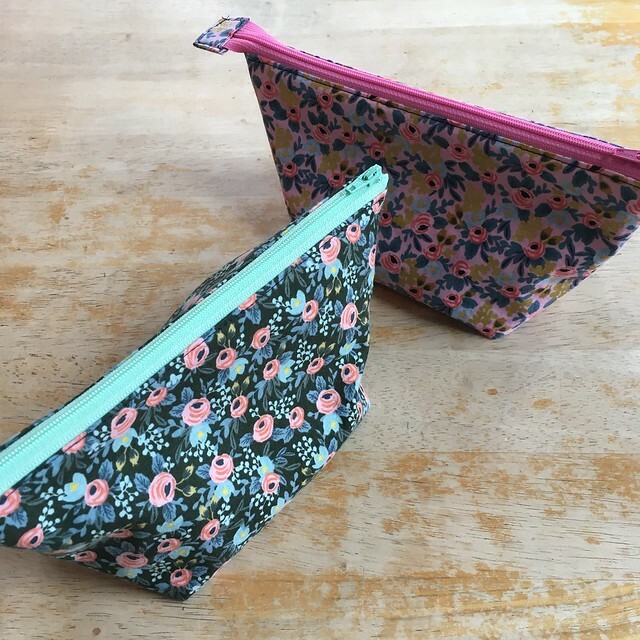 I chose to make two of the small size bags and reverse which fabrics were on the inside and outside, so I could have the best of all worlds with this pair of bags. I got my fabric (Rifle Paper Co. Menagerie Rosa in Hunter and Violet Metallic quilting cotton) and zippers from Pintuck & Purl. 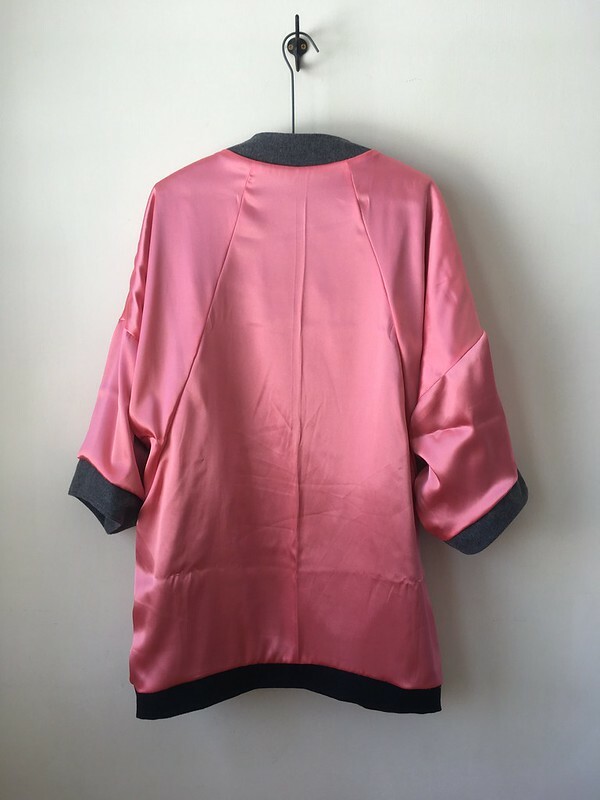 I used Fusible Featherweight interfacing from Pellon (because I had it on hand for garment-sewing) that I got from Joann Fabrics. 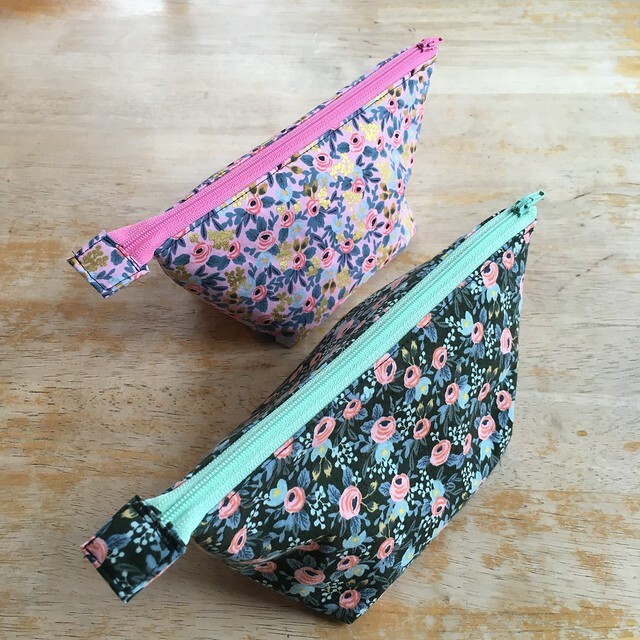 The small size bags start out as 10″ x 7″ rectangles of fabric, making the finished size slightly smaller. 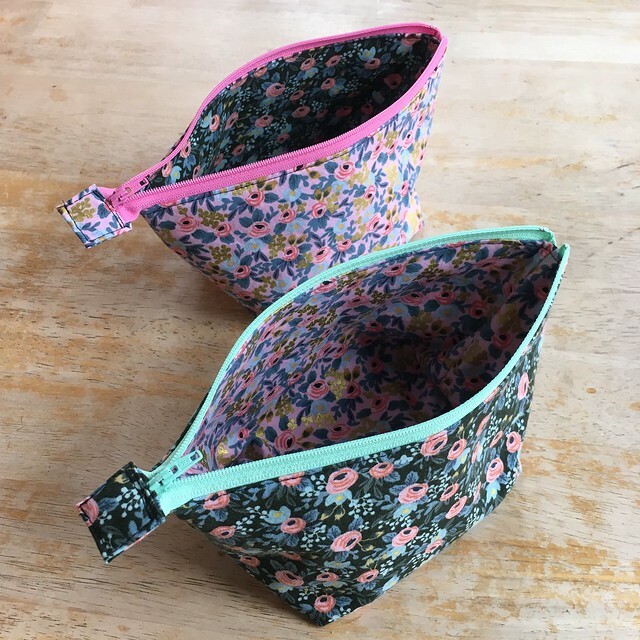 These are great for holding pens and pencils or as travel bags to hold all your odds and ends. 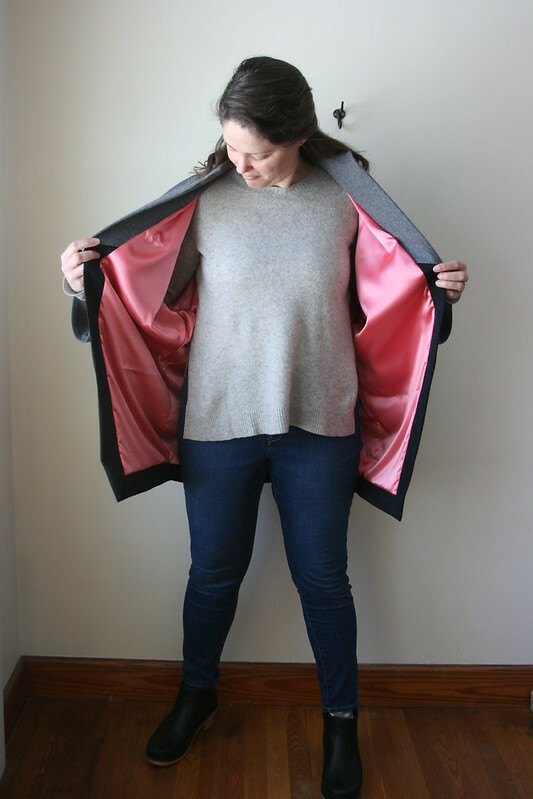 The tutorial itself is easy to follow and gives you a nice finished product where all the raw edges (including the zipper’s raw edges) are enclosed. My stitching on the zipper tab got a little wobbly, but I didn’t feel like ripping it out to do again, so I decided it was good enough. Glacier Park Cowl Number Two! Anyway, after knitting my first Glacier Park Cowl last year and loving it, I decided to make the pattern one more time. I thought I could improve on my first version, and I just found the pattern so enjoyable to knit. 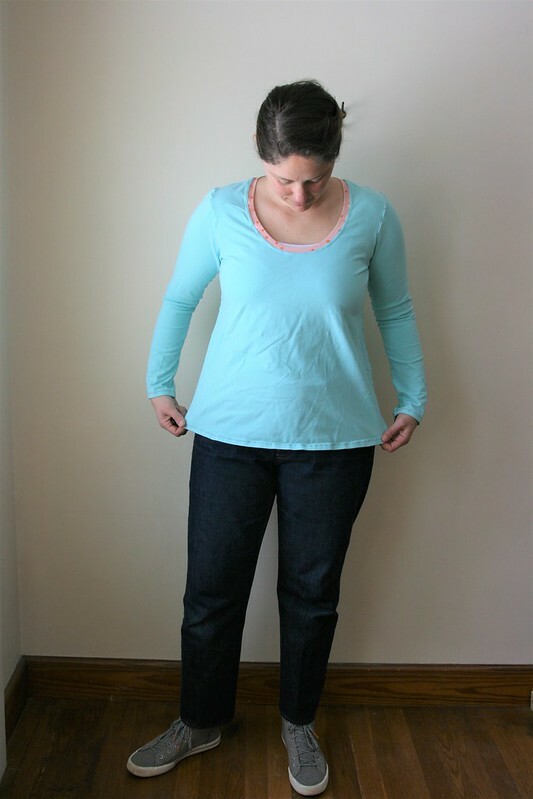 Things that don’t need precise sizing (and that are small) are really my sweet spot. 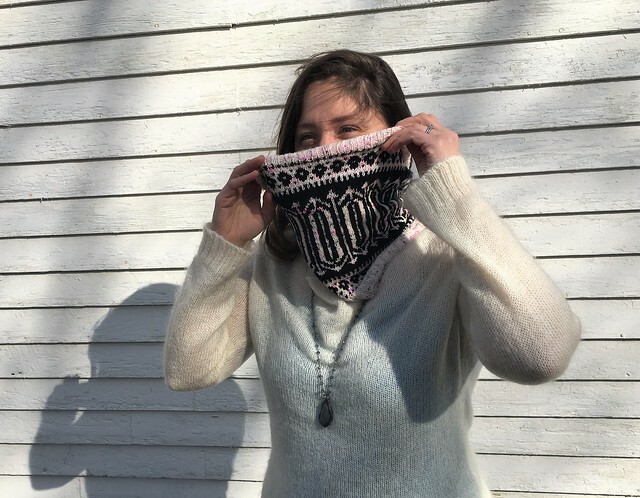 I had a cowl that I wasn’t very happy with (the white speckled one below) in some hand-dyed sock yarn plus a good amount of leftover black sock yarn from my last Glacier Park Cowl, so I could unravel the unsuccessful cowl and use the leftover black sock yarn. Perfect! The two most helpful things I learned before starting this second Glacier Park Cowl were the importance of color value and yarn dominance. For colorwork designs to be really clear and easy to visually understand, you want your colors to be different in value. An easy way to check is to take a picture with your phone and turn the color picture to black and white. 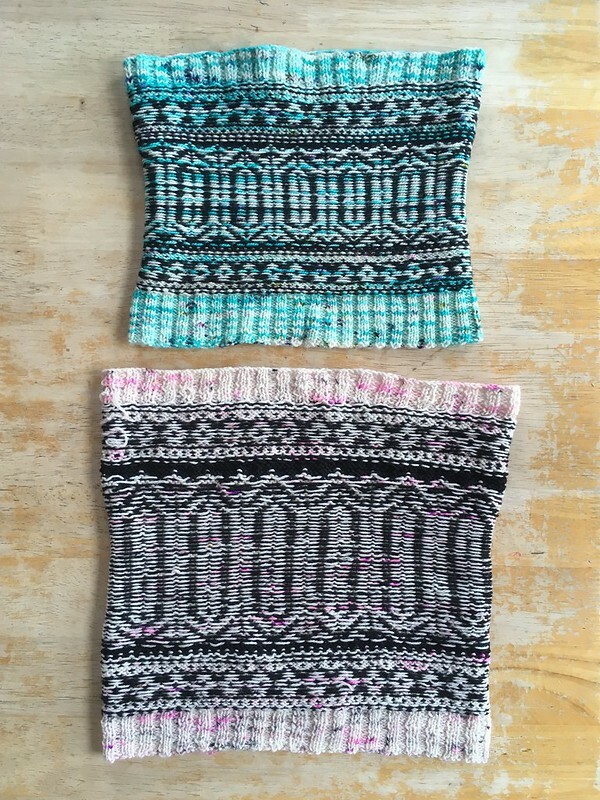 If the colors you have chosen are very different in value (say one shows up a light gray and the other is nearly black), your colorwork design will really pop. 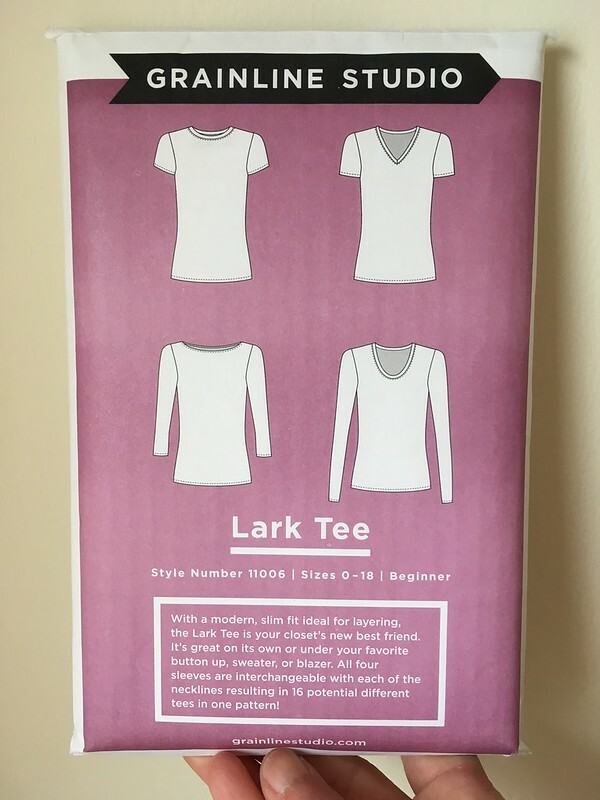 Brooklyn Tweed has an in-depth explanation of how this all works on their blog. Yarn dominance has to do with which part of your design you want to stand out the most. I wanted the black elements of my cowl to stand out more than the white speckled parts. 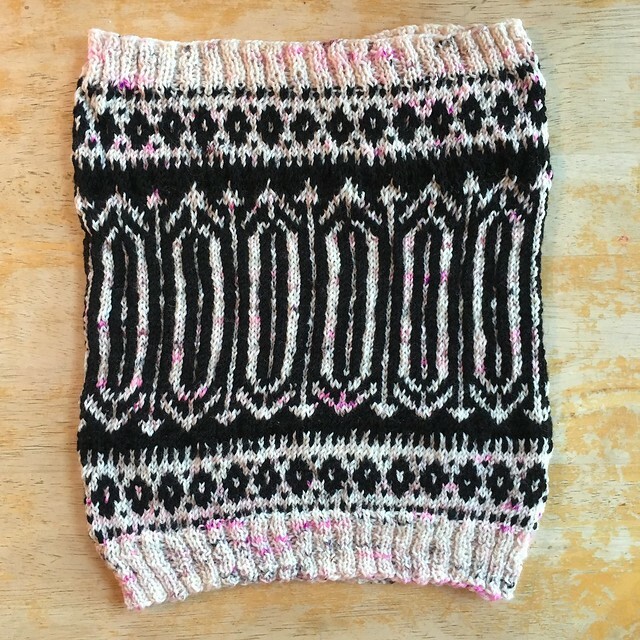 Since I was knitting Continental, holding both yarns in my left hand, I always held my background color (the white, speckled yarn) in the back (or to the left) of the color I wanted to be dominant (the black). 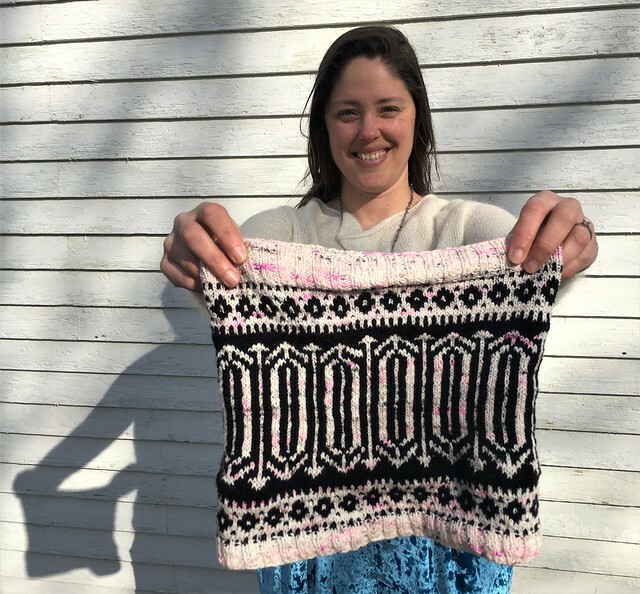 You can find a really clear explanation of all of this (including how to hold your yarn) in Andrea Rangel’s book Alterknit Stitch Dictionary (in fact, here are some of her quick tips for colorwork–number 4 talks about yarn dominance). For a more in-depth explanation of color dominance in a blog post, see this one from Paper Tiger. OK, so on to the project! 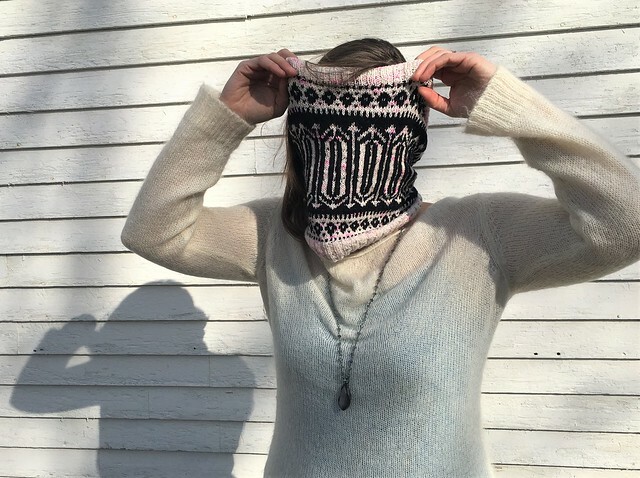 The Glacier Park Cowl is a pattern by Caitlin Hunter of Boyland Knitworks. I bought it on Ravelry through my local shop (Pintuck & Purl). This time around, I used Hedgehog Fibres Sock in Cheeky (also from Pintuck & Purl) and Malabrigo Sock in black. 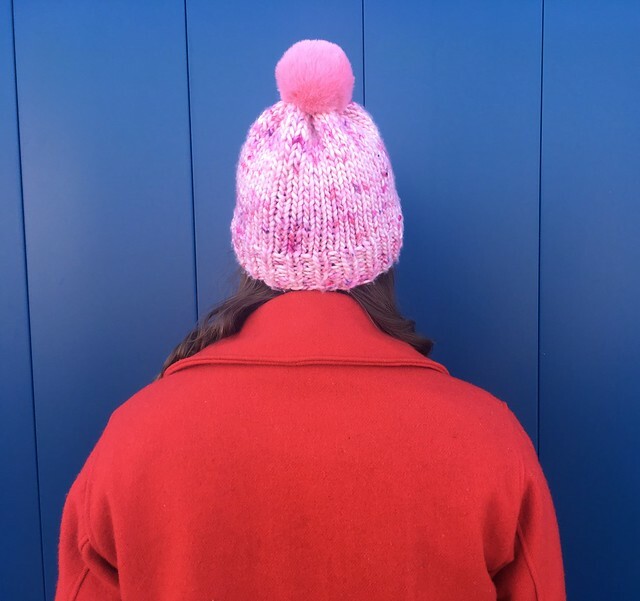 I knit fairly loosely once I get going, and so I used a US 1, 24″ circular needle for the ribbing and a US 2, 24″ circular needle for the colorwork. On my first version of this cowl, the colorwork section is smaller than the ribbing (it pulls in), and I was trying to prevent that this time around by going up a needle size for that part. I knit the full recommended length of the middle section of the project, making my second cowl much longer than my first. I was determined to get this project done before everyone in my house finished their Christmas Break. It’s hard to resist doing one more row when you can see the project taking shape and each row of the chart feels like progress. I also love knitting with a speckled hand-dyed yarn because you never know when another little bit of color will show up. This particular yarn is mostly white with little black and pink speckles throughout. It does split a bit from time to time if you aren’t careful, but you get used to that. I loved knitting this pattern. The surprise was in finding that as I went along, my knitting got looser! After doing more reading, I found that I’m not the only one this happens to, but it was funny when I finished and the end was wider than the beginning! A lot of it has evened out with blocking, so it’s not a big deal, but it’s very useful to know. You can see it a little more clearly in the picture below. The bottom was where I began and the top was where I finished. Interestingly, because my white yarn was so wavy from its former life in the unsuccessful cowl, I ended up blocking this twice before it started to relax. The above picture is after blocking once (or before blocking? I can’t remember.). The other pictures are after blocking twice. 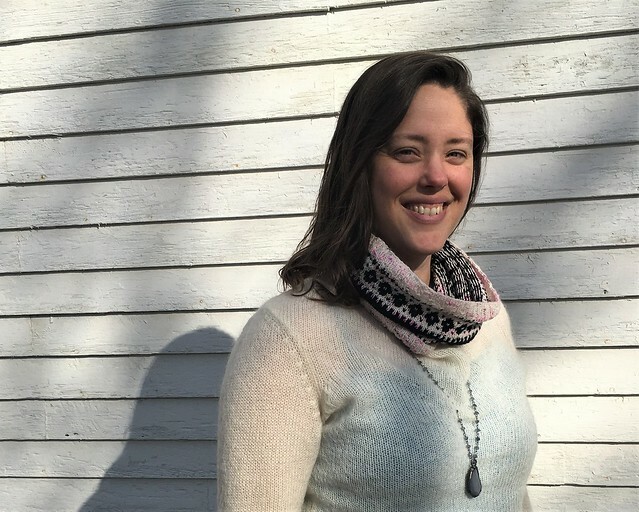 I’m really happy with this knit, and I have been wearing it and my first Glacier Park Cowl all the time. 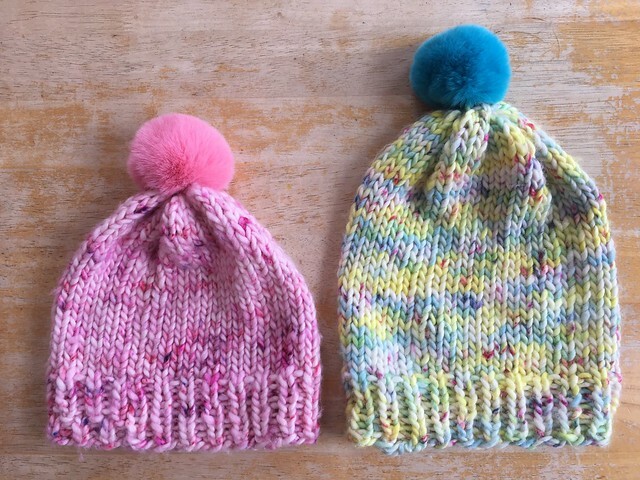 Even though I was initially horrified at the thought of knitting such skinny yarn on such tiny needles, I loved this project, and would totally make it again in other fun colors. 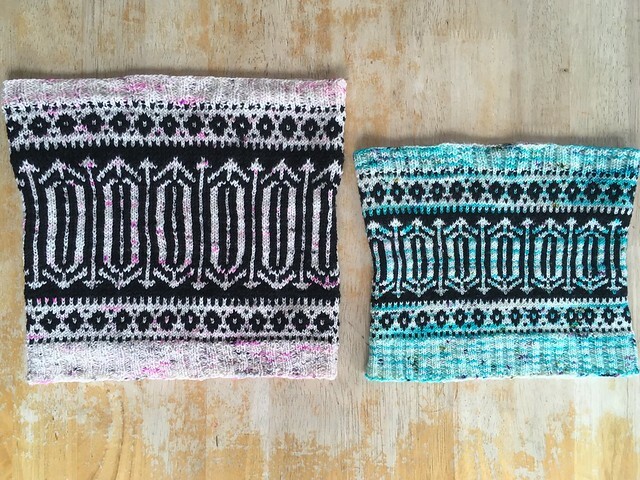 If you are a knitter, do you have any favorite colorwork patterns to share? I have some slightly scratchy bulky yarn in several colors I would love to use at some point, but I just can’t find the right pattern. 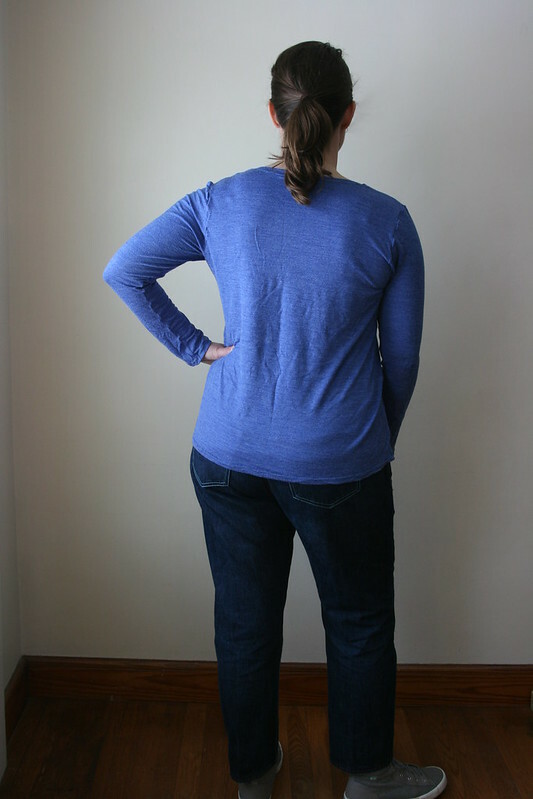 It’s listed as a worsted, but it knits up like a bulky (plus I’m a loose knitter). I would love recommendations. 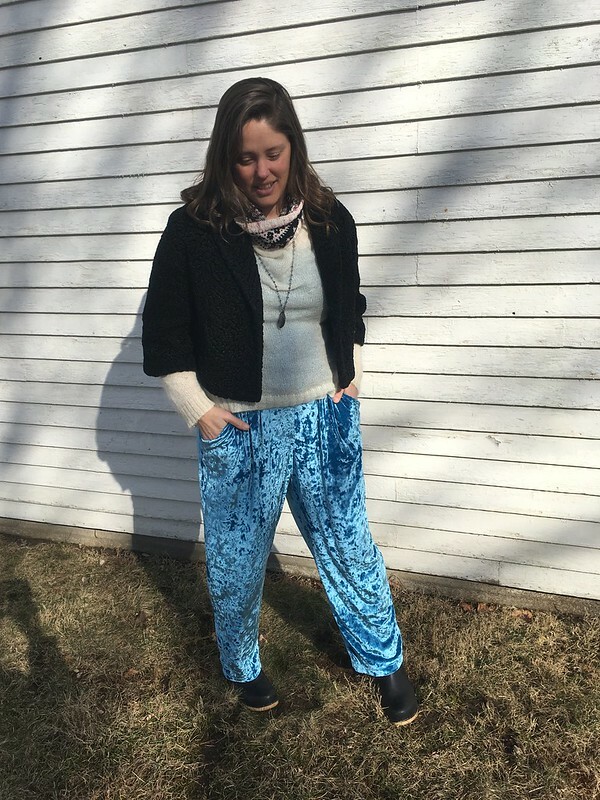 I will tell you that the jury is still out on these pants…I just can’t decide how I feel about them. 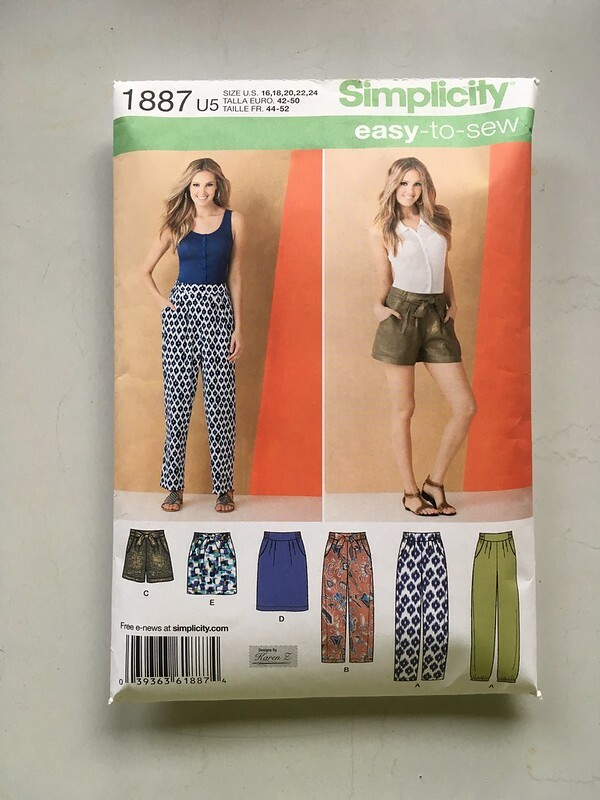 Over the summer, I made View C of Simplicity 1887, a pair of sparkly linen shorts, which I love. 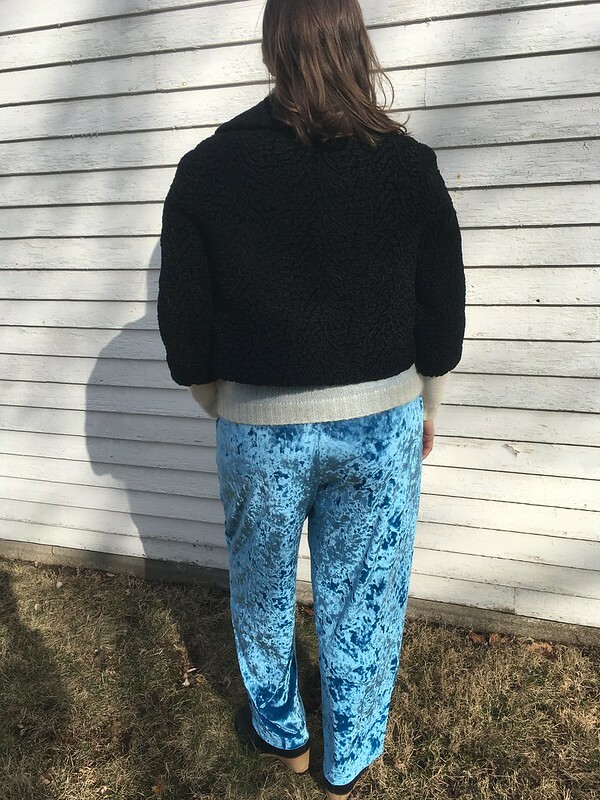 I have wanted to make the pants ever since I got this pattern. 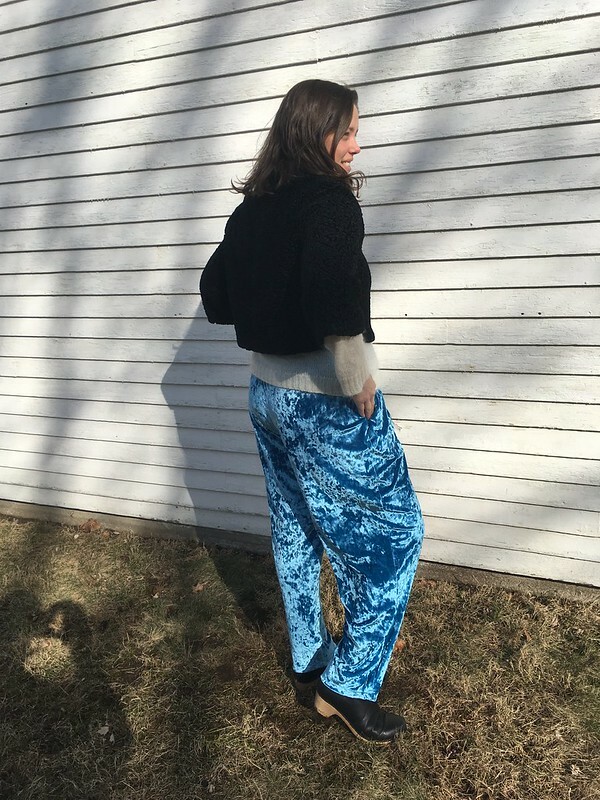 Despite the fact that I could have made these out of a drapey denim-like chambray living in my stash, I decided to take a chance on something much less practical–crushed stretch velvet. Because, why not? 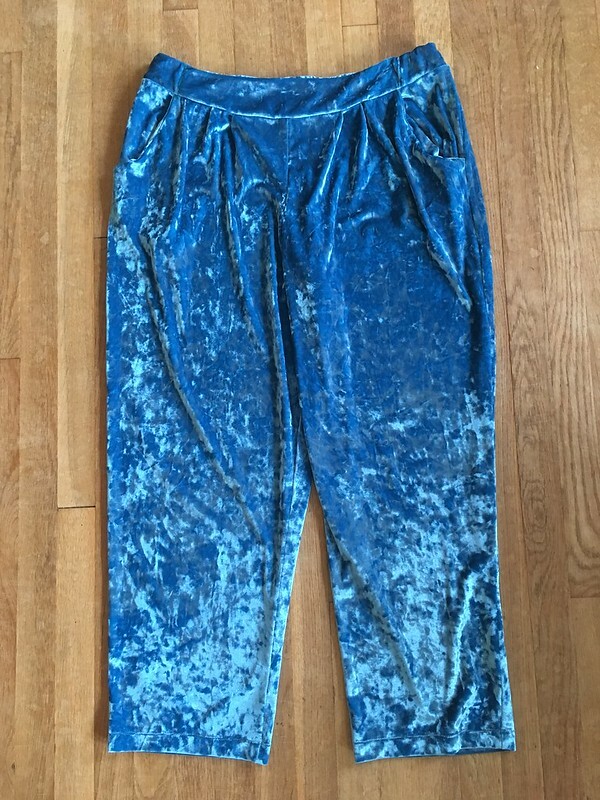 I saw the velvet at Joann Fabrics, it was close to Christmas, and I knew I could whip these up pretty quickly if I could find a bit of time. And then I would have fancy pants for Christmas Eve! I always want to make something fun for church on Christmas Eve, but I rarely do. So I bought the velvet (well, technically it’s Stretch Panne Velour Knit Fabric). It’s a polyester/spandex blend: 90%/10%. I loved the color and in the winter I’m all about fun textures. I finally managed to find a bit of time and I whipped these up. I’m not the fastest sewist, but when you don’t have to finish any seams (and since this is a knit, you don’t), sewing goes a lot more quickly. It also helps when you’ve made the pattern in some form before. I made one mistake and one change. My mistake was in not being careful when lining up the front and back waistband. 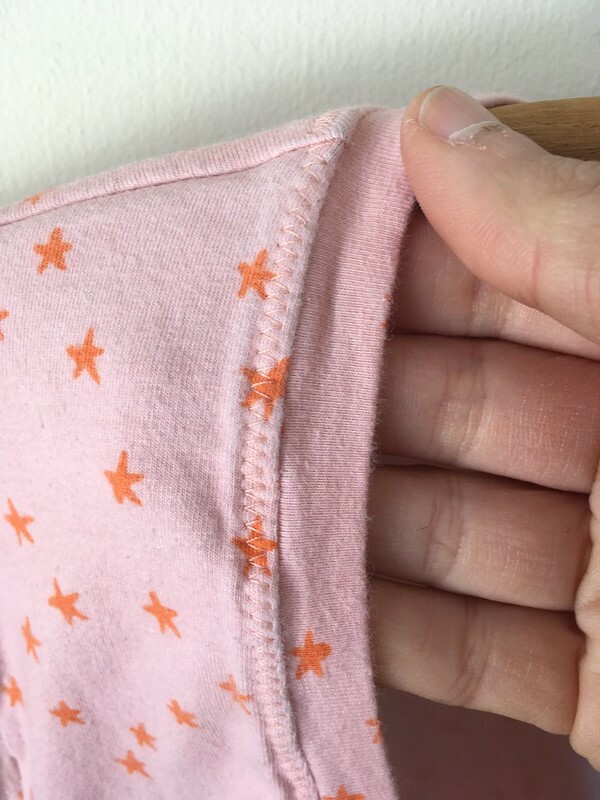 The side seam edges need to match up so that when you fold the waistband in half to baste the bottom edges together, they will match up easily. I tried to fudge this, but then I paid for it going forward. 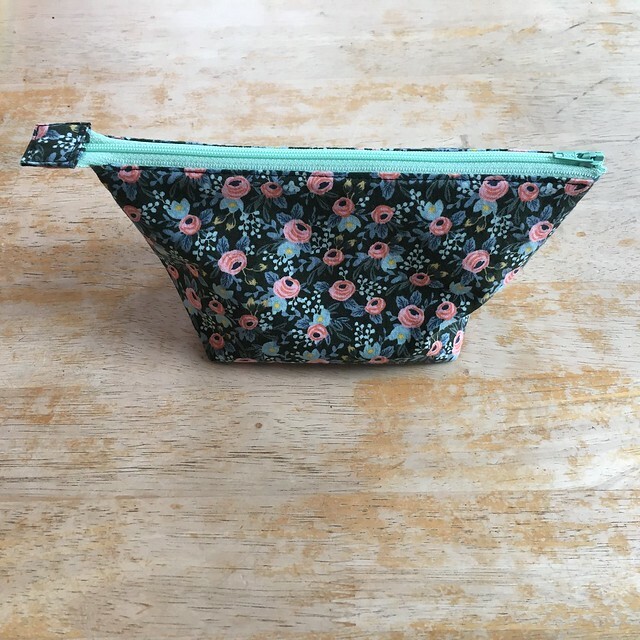 The one small change I made was to use 1 3/8″ wide elastic in the back waistband instead of two lengths of 3/4″ elastic and two casings. I don’t remember why I did this–probably it was based on what I had on hand, but it turned out ok. When I finished these, I just wasn’t sure what to think. They are so comfortable, although the smooth wrong side of the fabric is a little on the colder side. 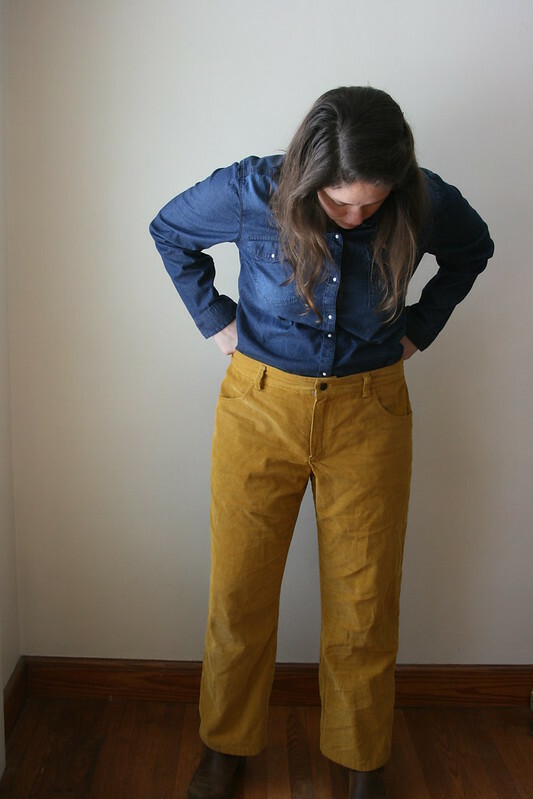 Luckily, these pants are pretty roomy, so you can definitely fit some long underwear underneath if necessary. I finished them before Christmas Eve, so I threw them on with a sweater and blazer for church, but I definitely felt like the ’80’s called and wanted their clothes back. I didn’t want to make a snap decision, though, so I wore them again with a different top and it was better, but still not quite there. 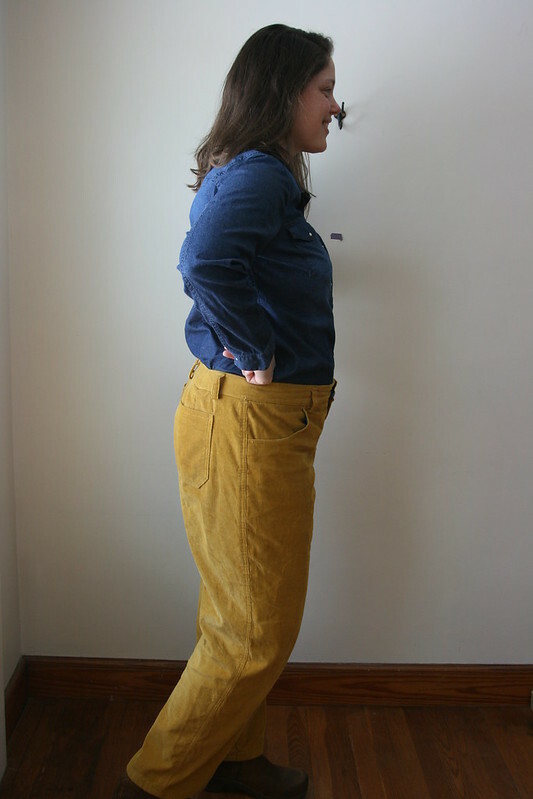 I really love the soft texture and the color, though, so I’m going to reserve judgement and keep trying these pants. 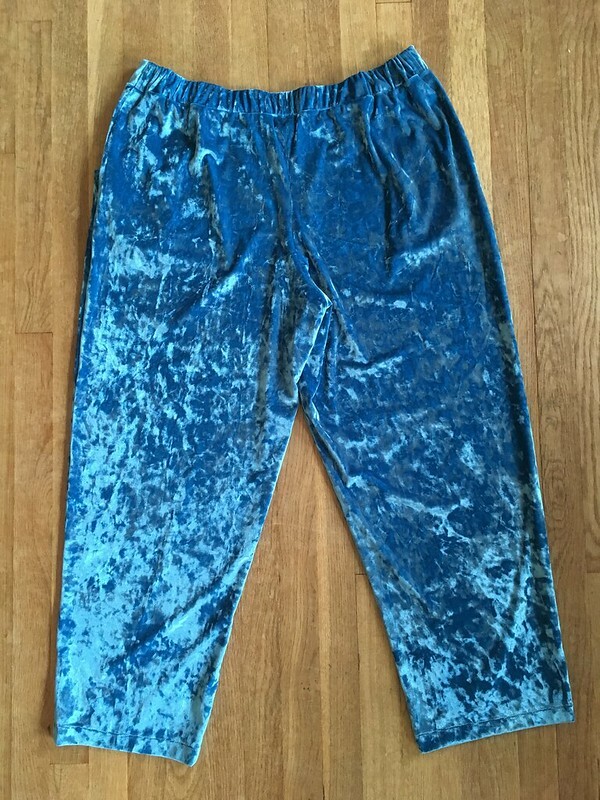 If I finally decide I don’t love them, they will make some pretty great lounge pants. 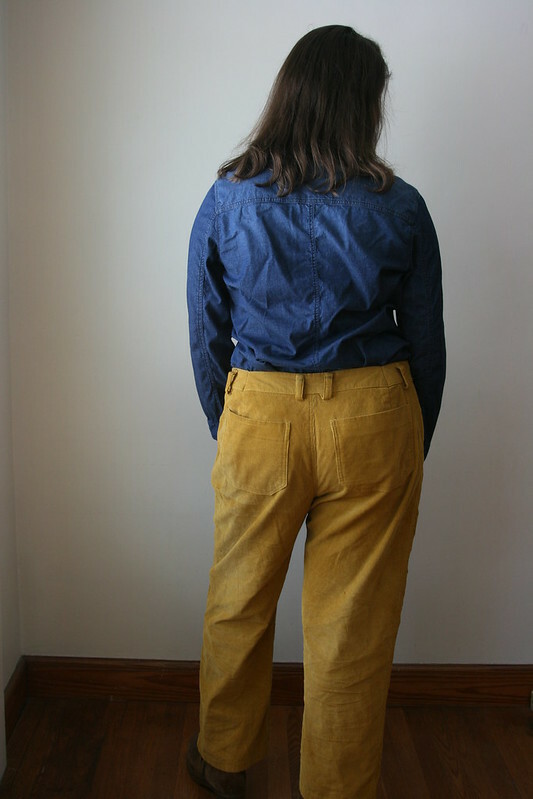 The pattern itself is definitely worth trying again in another fabric–a midweight Tencel twill would be great, actually! 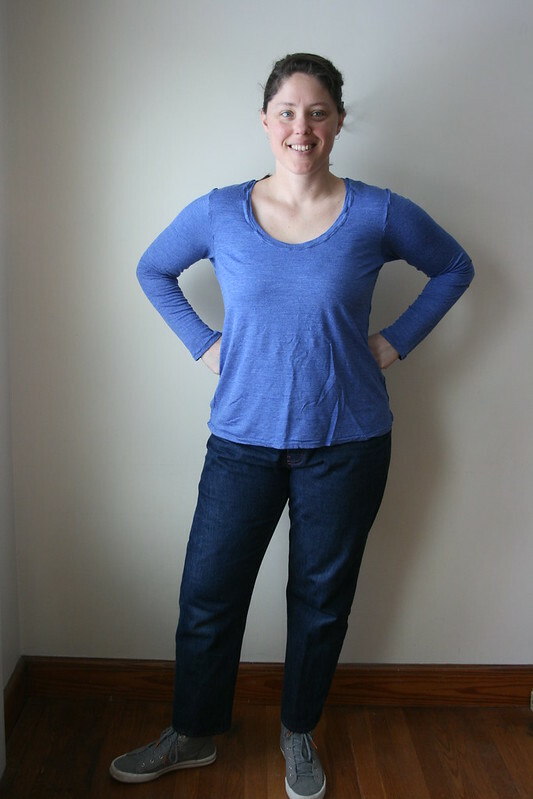 The flat front waistband with elastic back, the big pockets, and the relaxed fit are real winners. 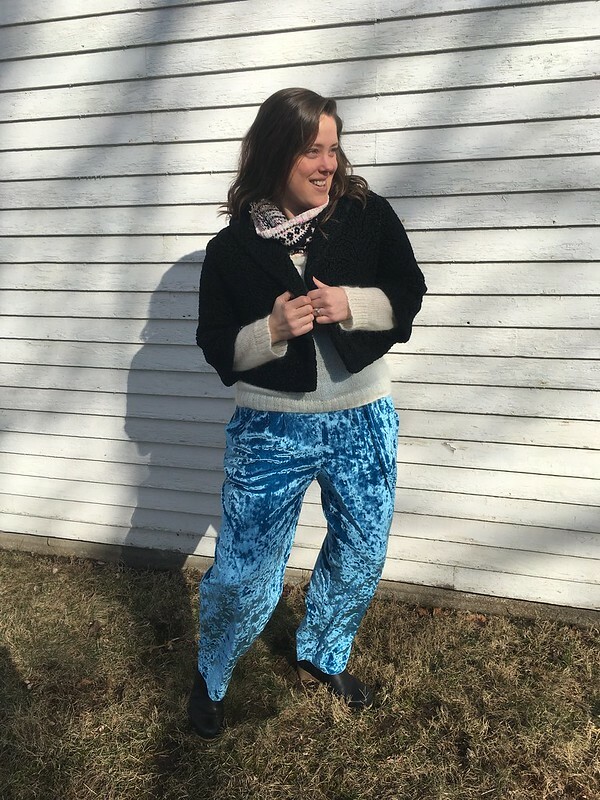 No matter what I end up deciding, I’m really glad I tried making these fun, weird pants. Hi, everyone! After a nice, long break, I think it’s time to get back to it! 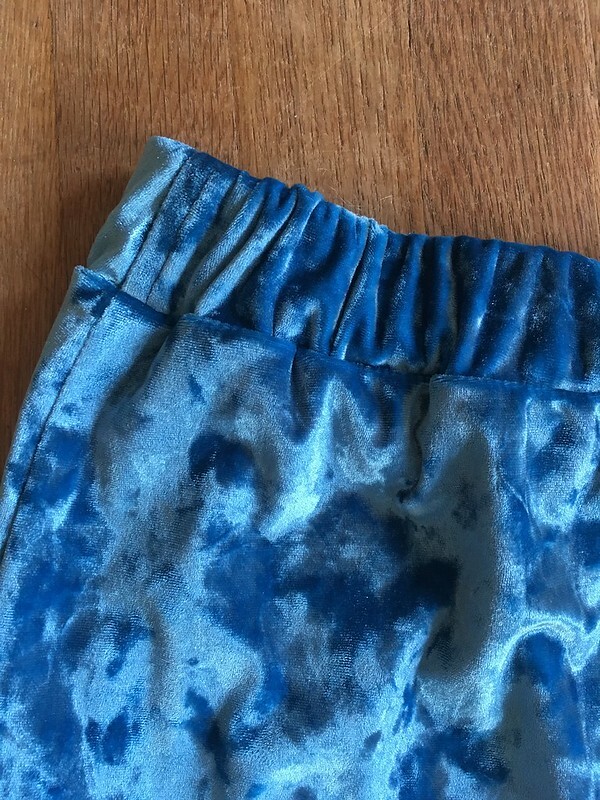 Having said that, this post isn’t actually about sewing, but it is about something that is alive and well in the making community: visible mending. 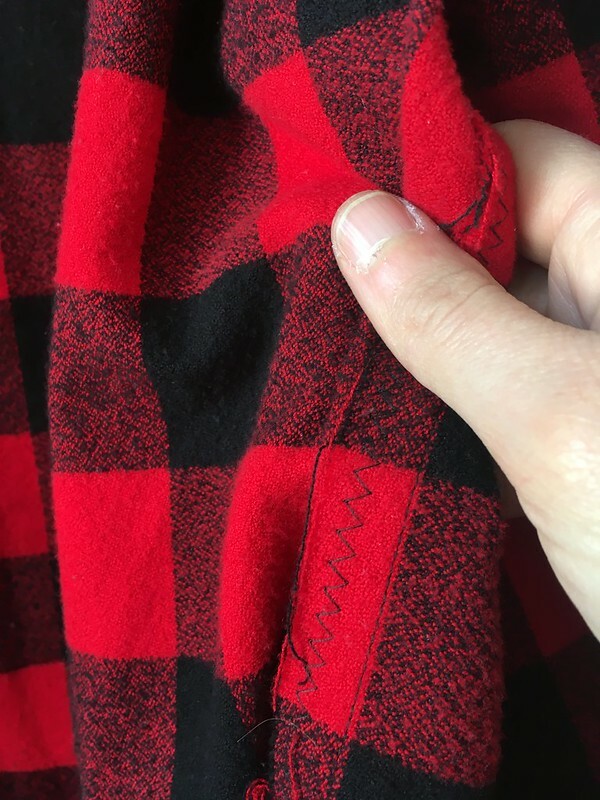 If you search “visible mending” on the internet, you’ll come up with a lot of different ways to take the idea of mending, which is often viewed as something boring or antiquated or a waste of time, and turn it on its head. 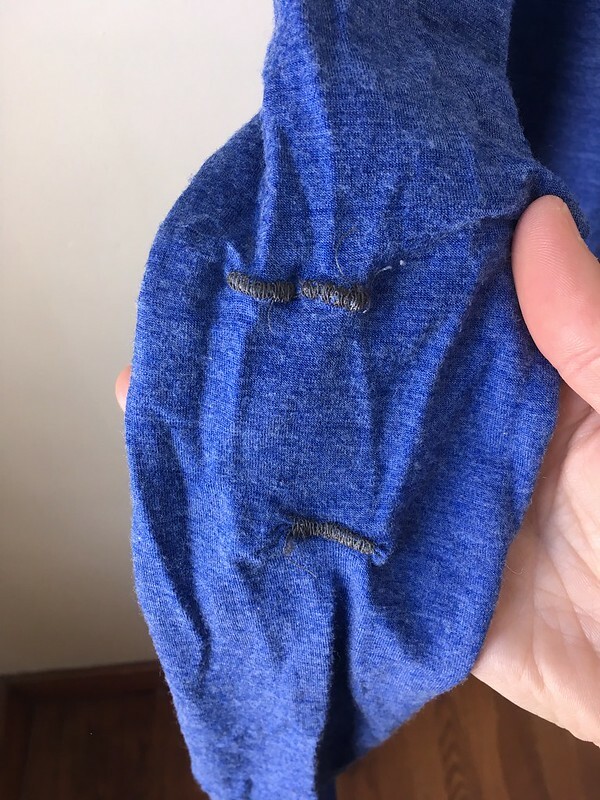 What I love about visible mending is that it takes the idea of mending being drudgery and elevates it to something interesting and beautiful. 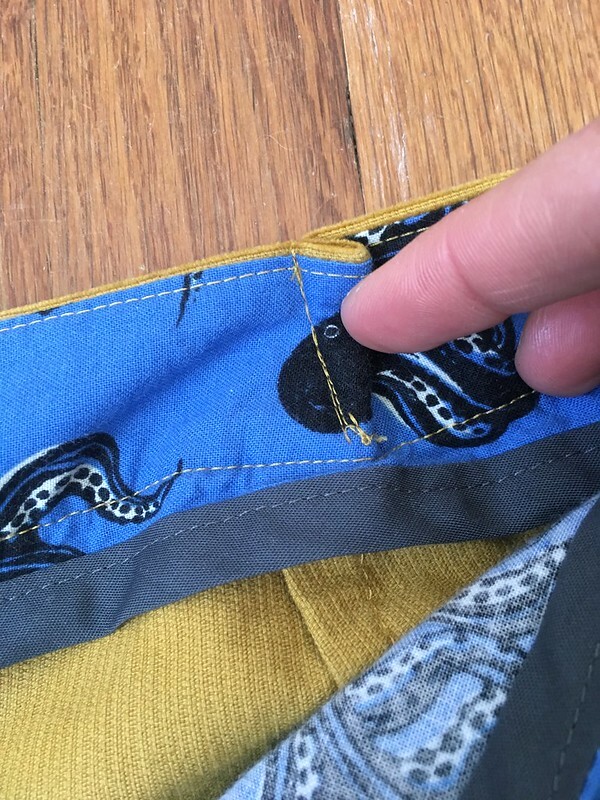 Now, you don’t always want your mending to be visible–of course it depends on the garment and your vision for it, but if you decide to go the visible mending route, why not make it fun? 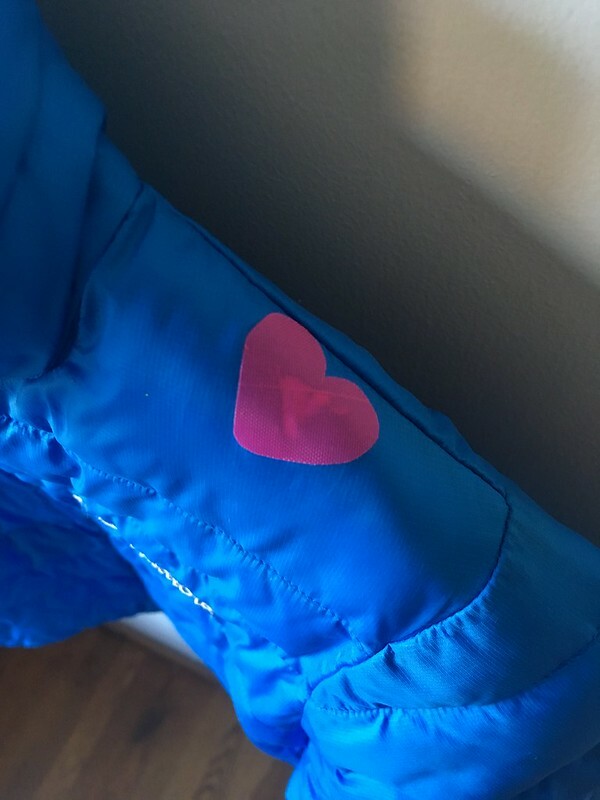 In that vein, I decided to think about a fun way to mend this little jacket that I found at the thrift store. It was in good shape aside from a few light stains and some small holes. My original idea was to zig zag stitch back and forth over the holes in bright, contrasting colors. Then a half-forgotten thought surfaced in my mind. 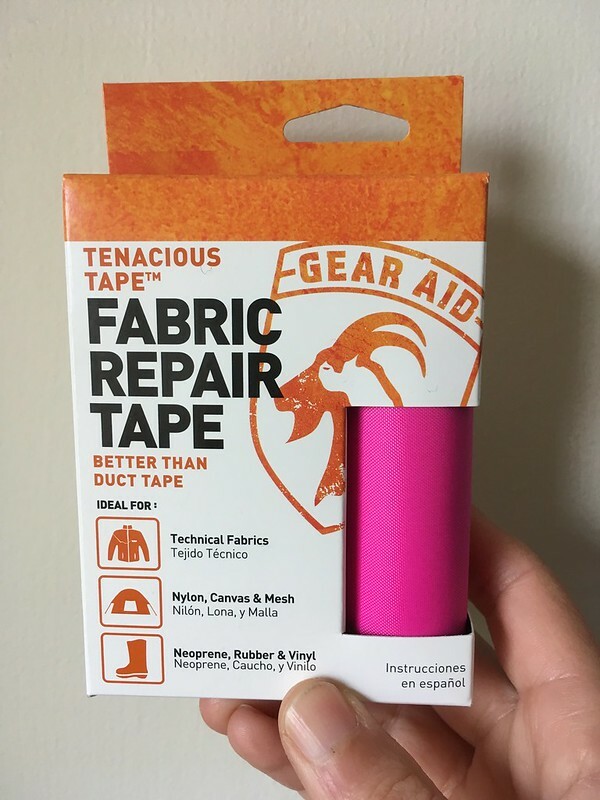 Someone had mentioned some sort of tape you could use to fix jackets and backpacks. 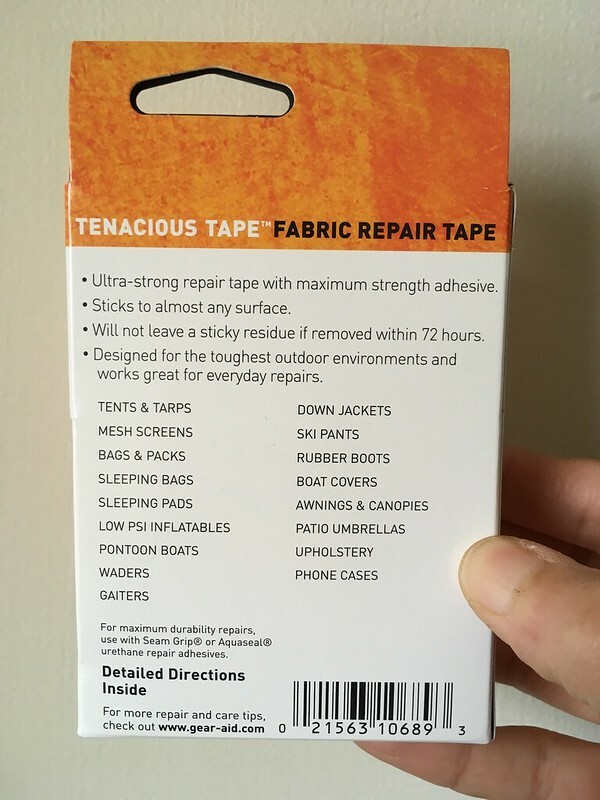 I started looking around on the internet and found this: Tenacious Tape. 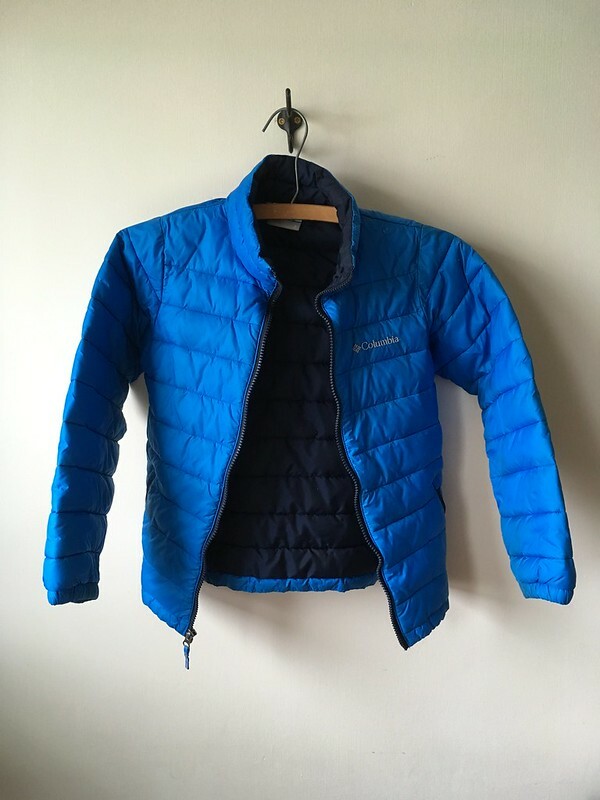 This isn’t a sponsored post or anything; I wanted to talk about it because it provides a quick and easy way to fix down jackets and more. 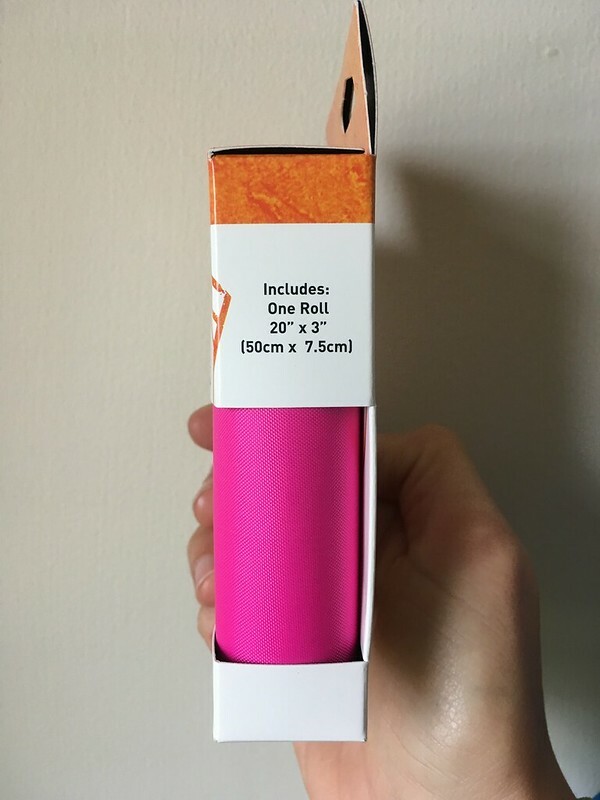 You can use it on your camping gear, your sleeping bag, neoprene, rubber, and vinyl, and you can machine wash garments that have this tape on them without it coming off. 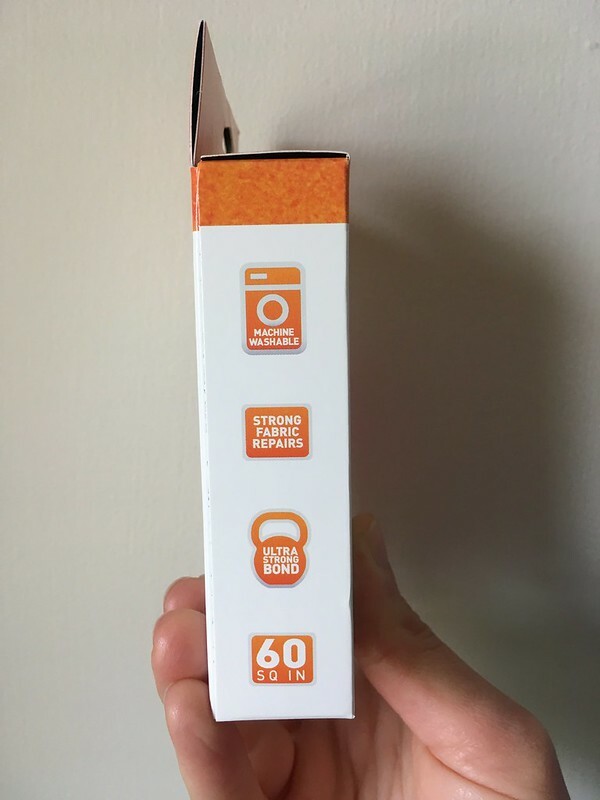 It comes in lots of colors as well as clear and reflective options, and even precut shapes. It is pretty expensive relative to the amount you get. 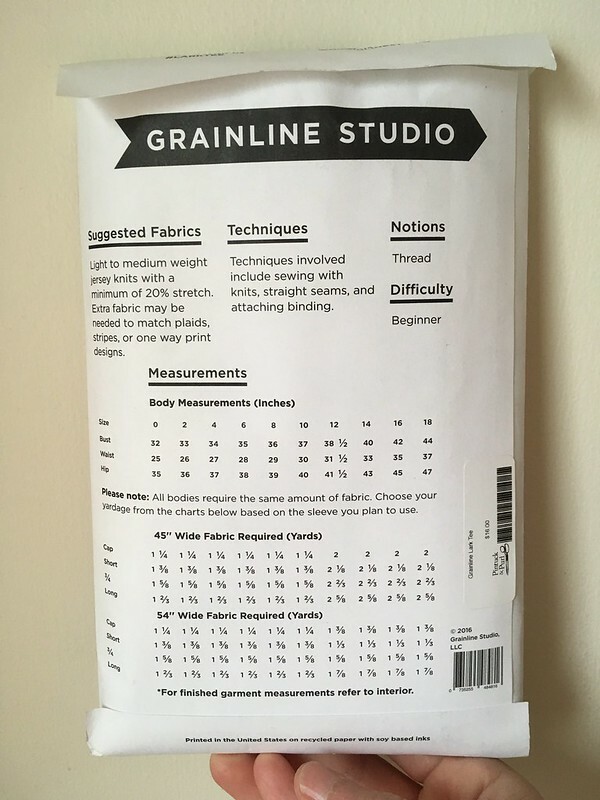 I think I paid around $10 for a 20″ x 3″ rectangle, so following my multi-color idea in tape rather than stitching didn’t seem very economical, especially when I was trying to save money by thrifting. To be fair, this color was probably the most expensive option. 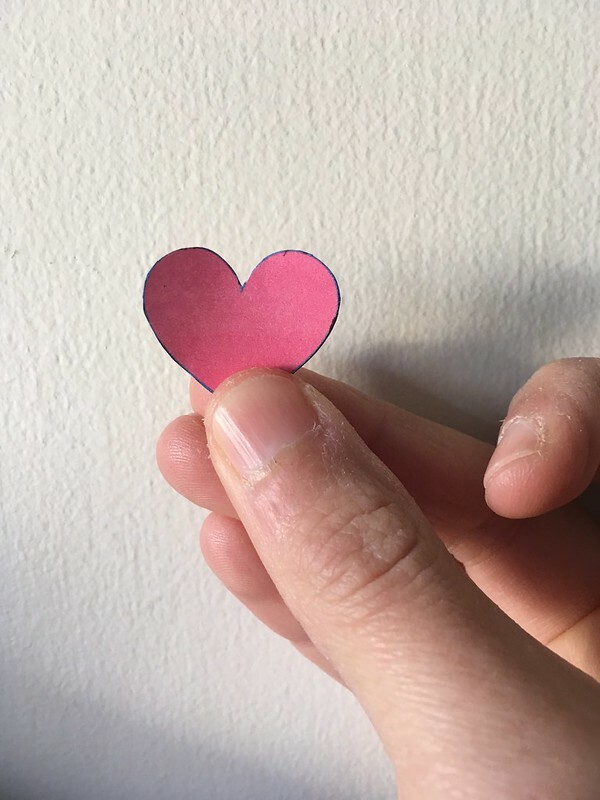 Next, I chose a simple shape–a heart–and printed it off from my computer to make a little template. I printed it in pink to get an idea of how it would look. 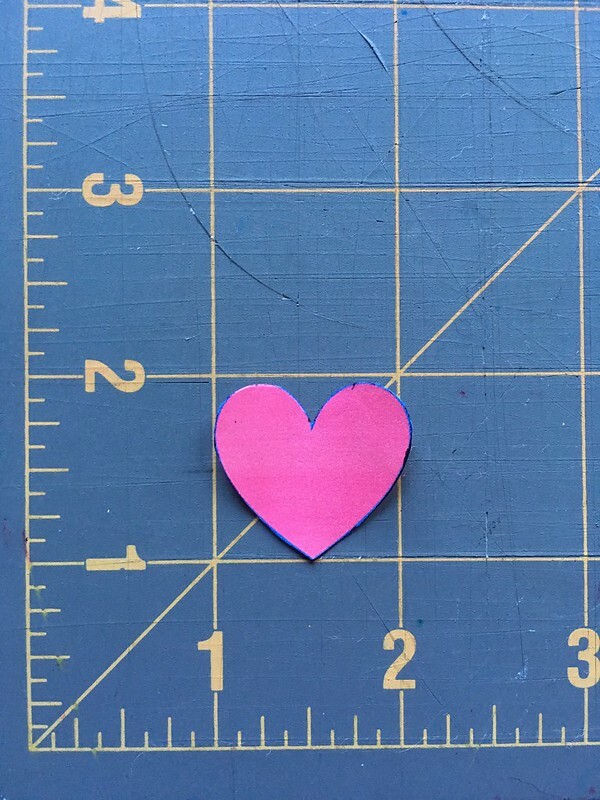 On the back side of the tape, I traced the number of hearts I needed to cover all the holes and carefully cut them out. Before sticking them on, I had to clean each area I wanted to repair with isopropyl alcohol and trim any threads. 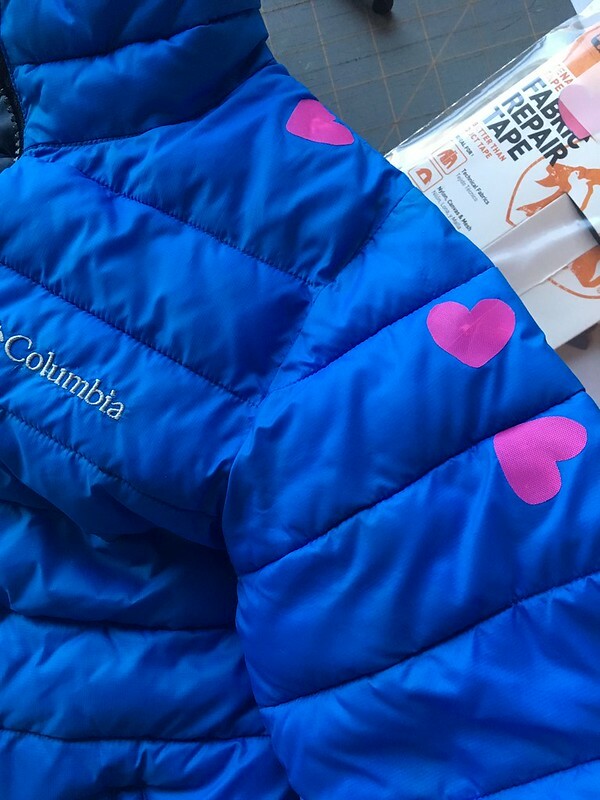 After that, all that was left was to peel off the backing and carefully stick the little hearts over each of the holes. 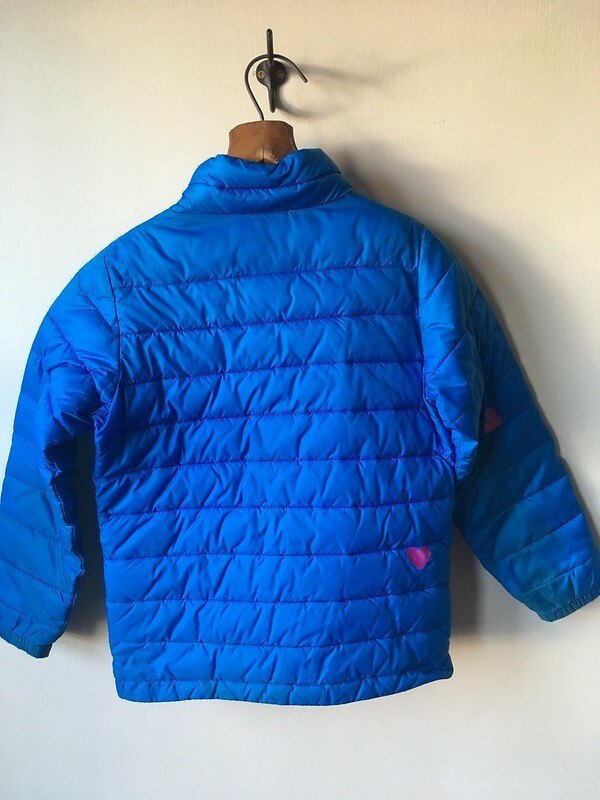 Now it’s in perfect shape for a little person who needs a warm fall/winter jacket!